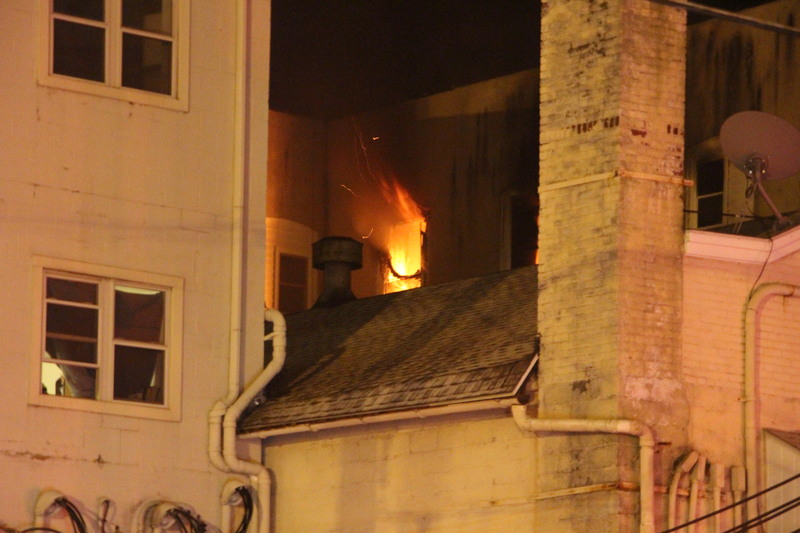 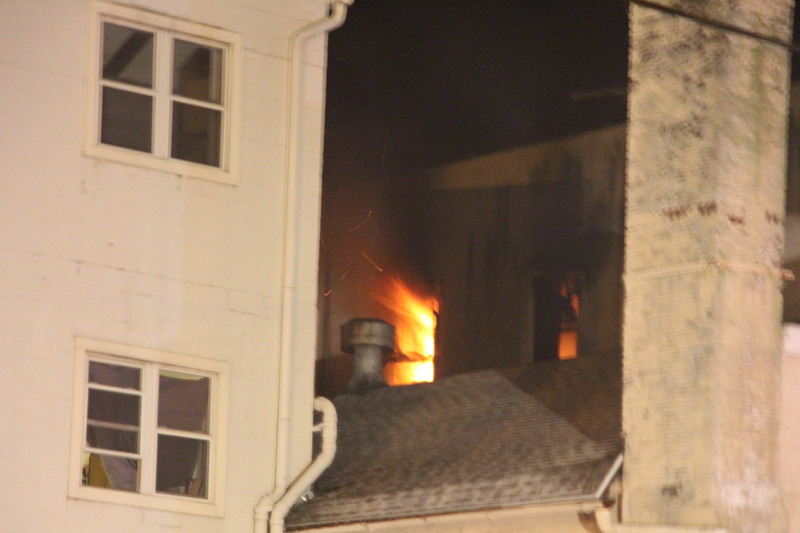 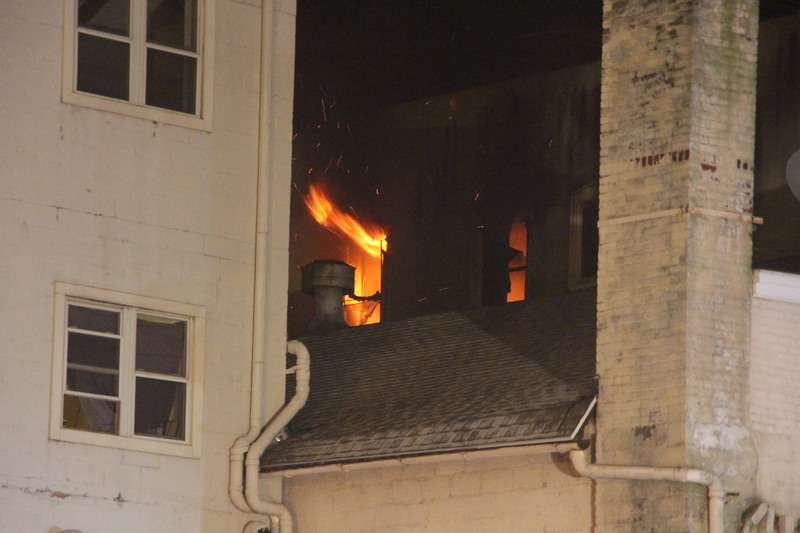 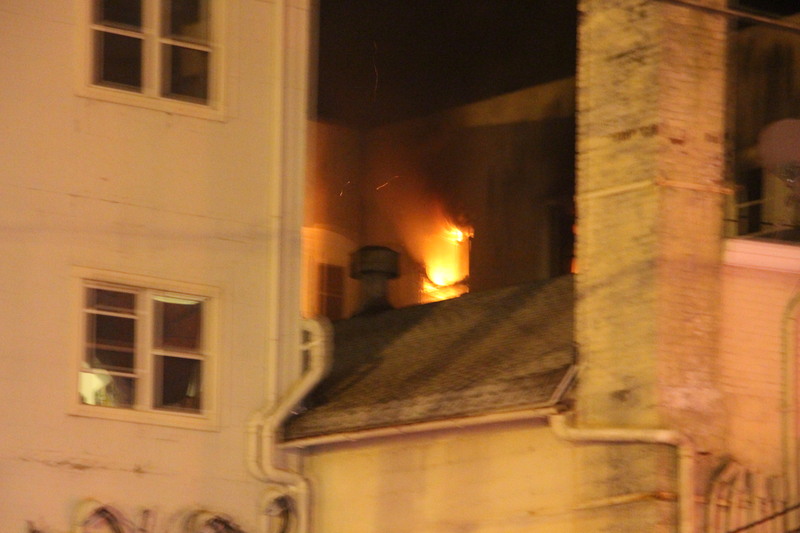 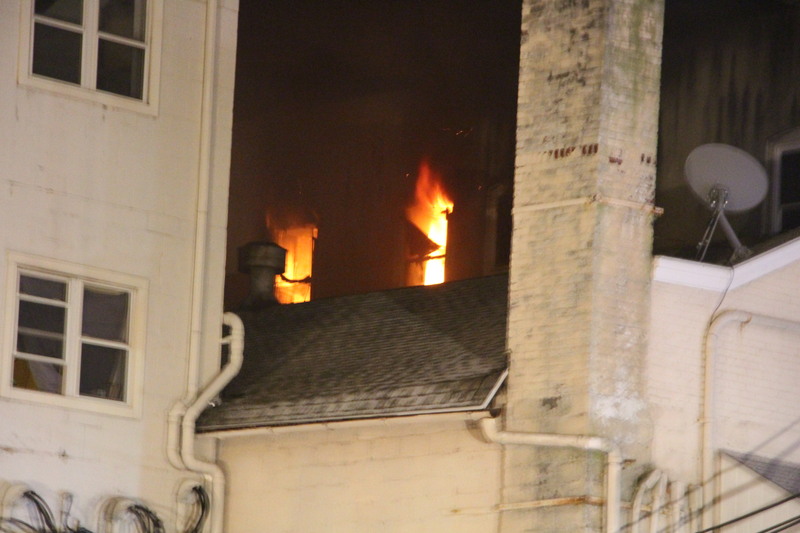 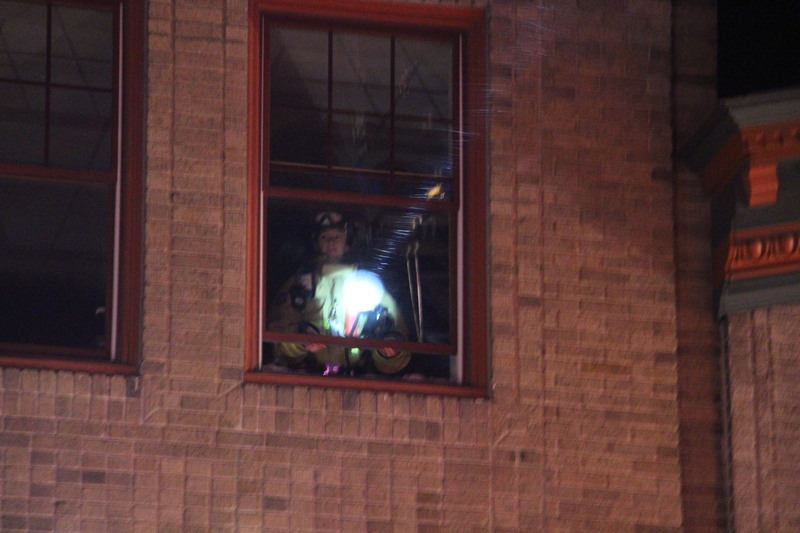 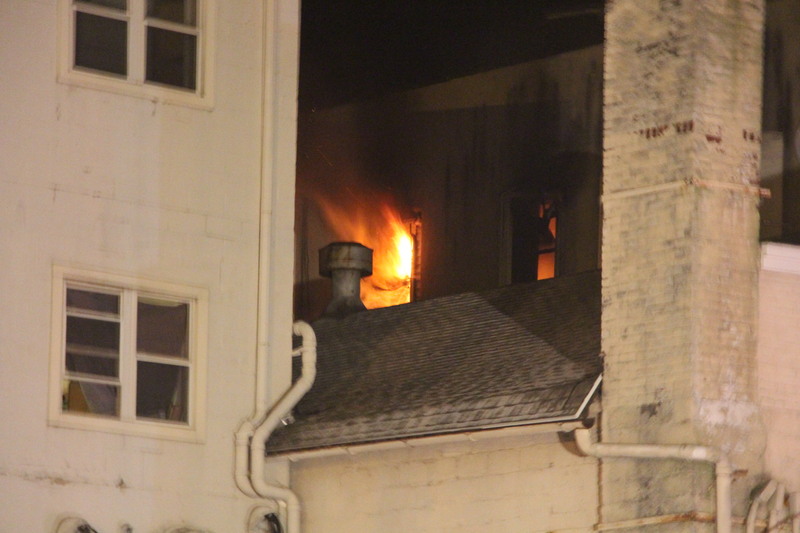 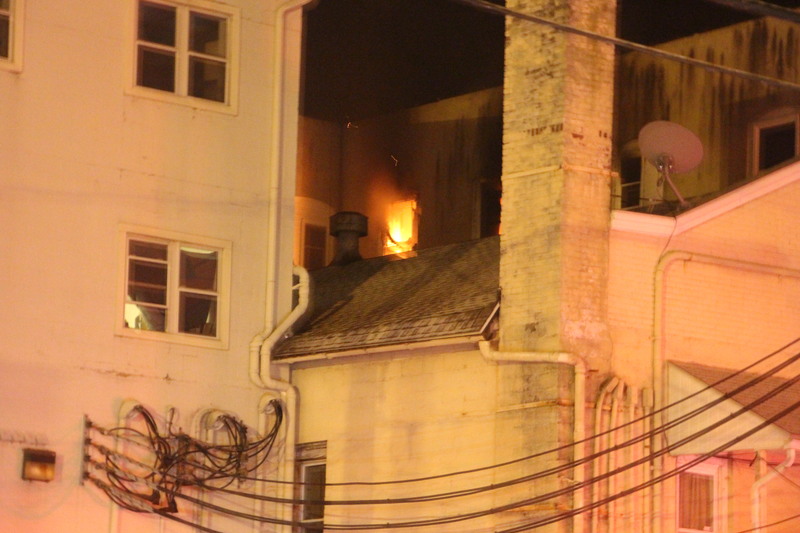 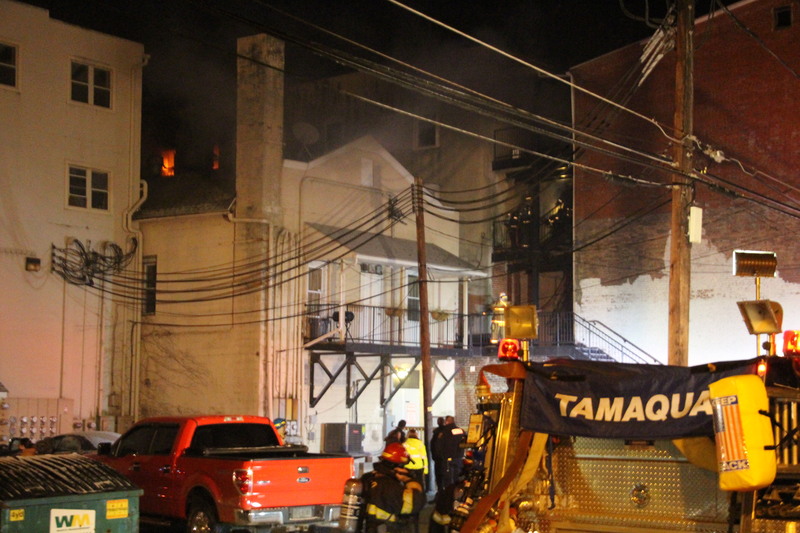 Flames could be seen shooting out two windows on the top floor of a downtown apartment building in Tamaqua. 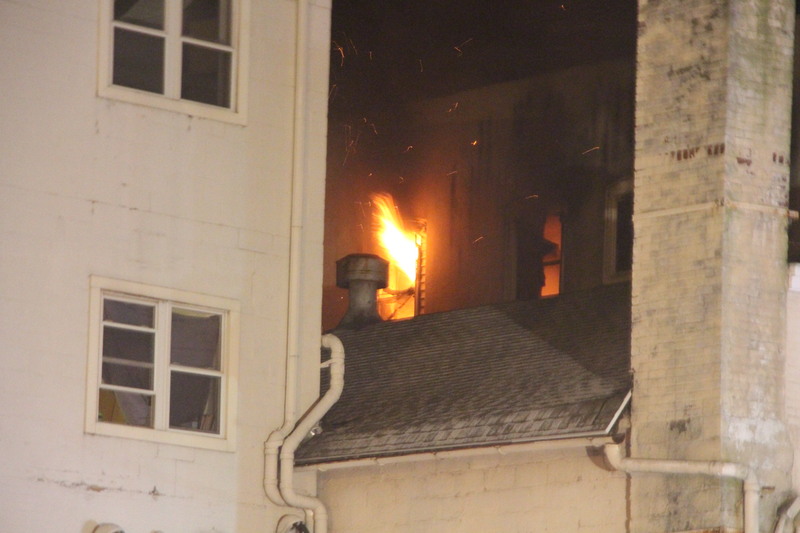 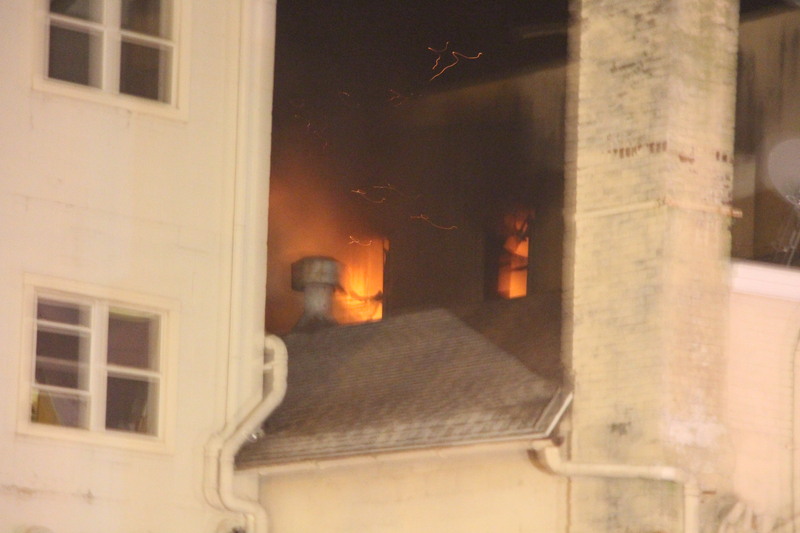 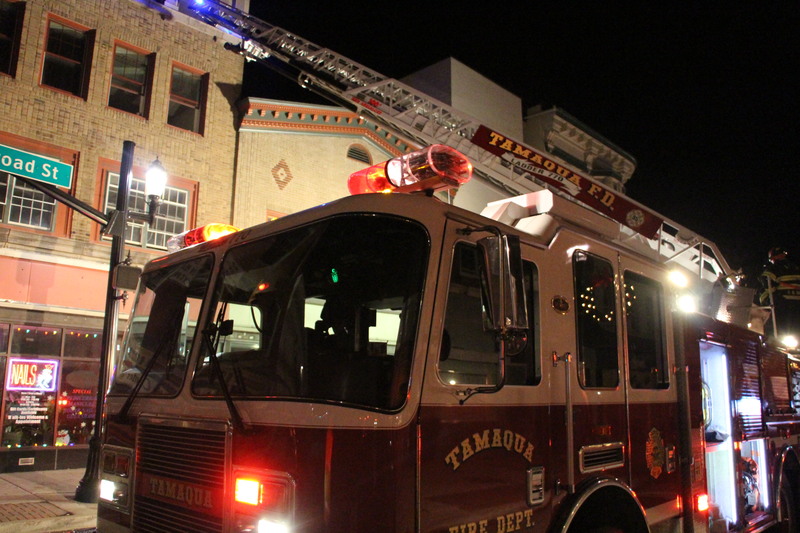 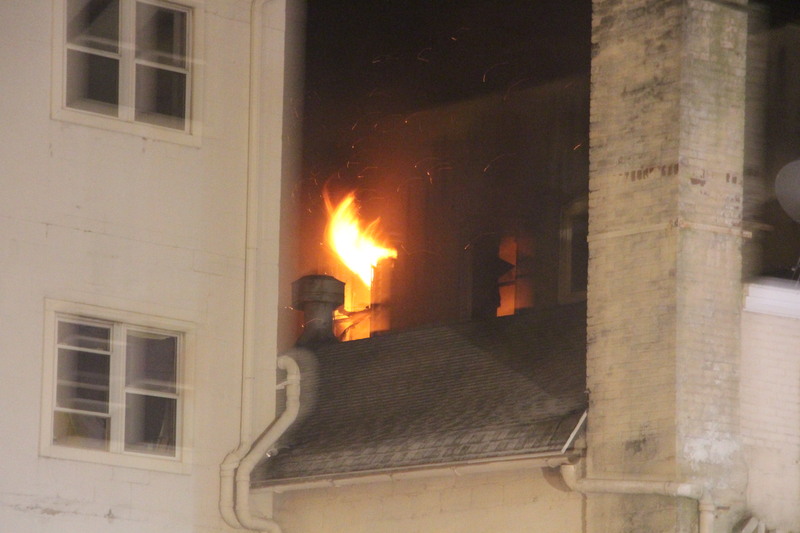 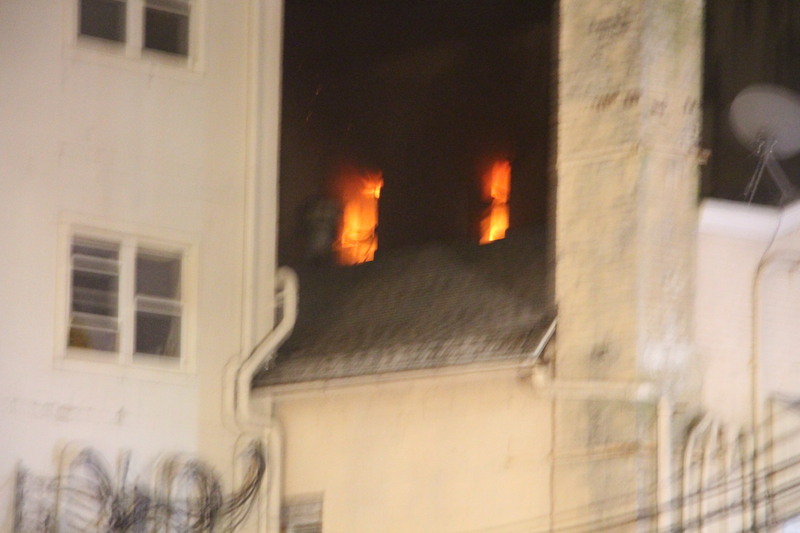 Flames can be seen shooting out windows of a downtown Tamaqua apartment building just before 2 AM today as firefighters from Tamaqua and surrounding areas converged on the scene. 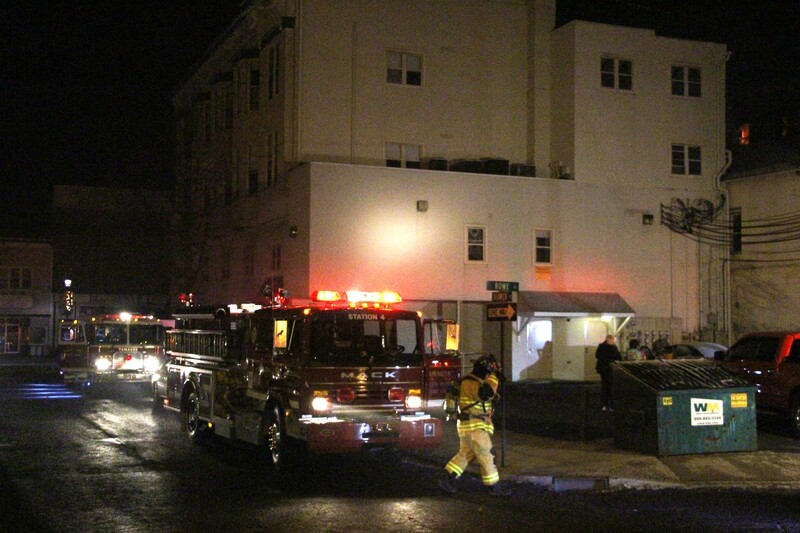 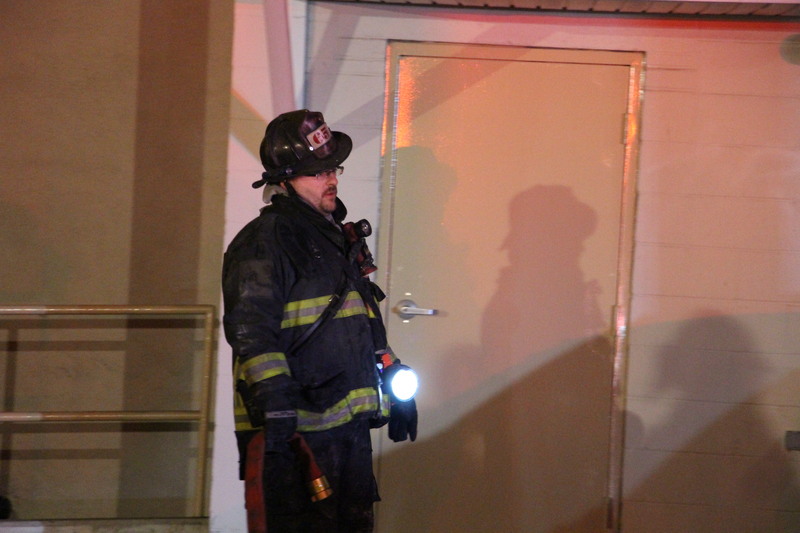 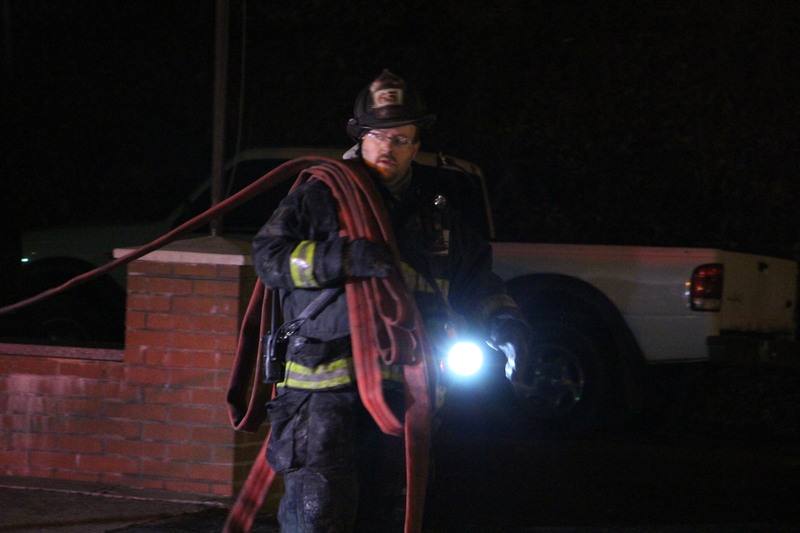 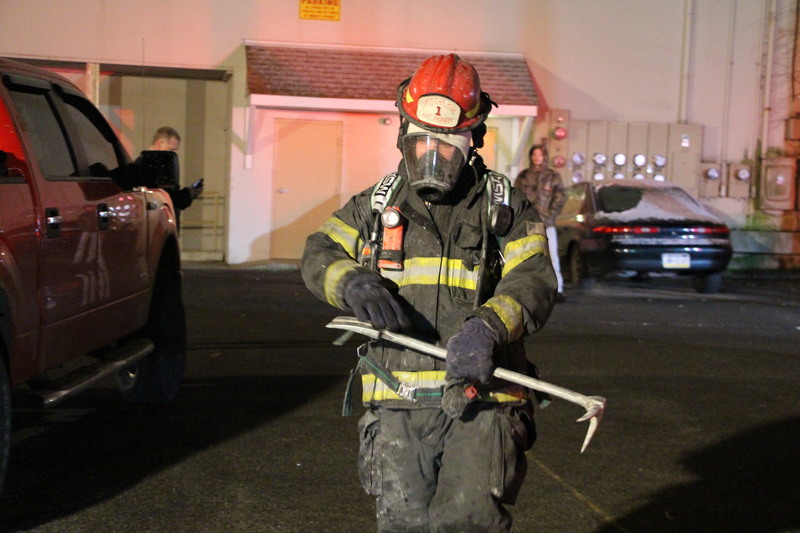 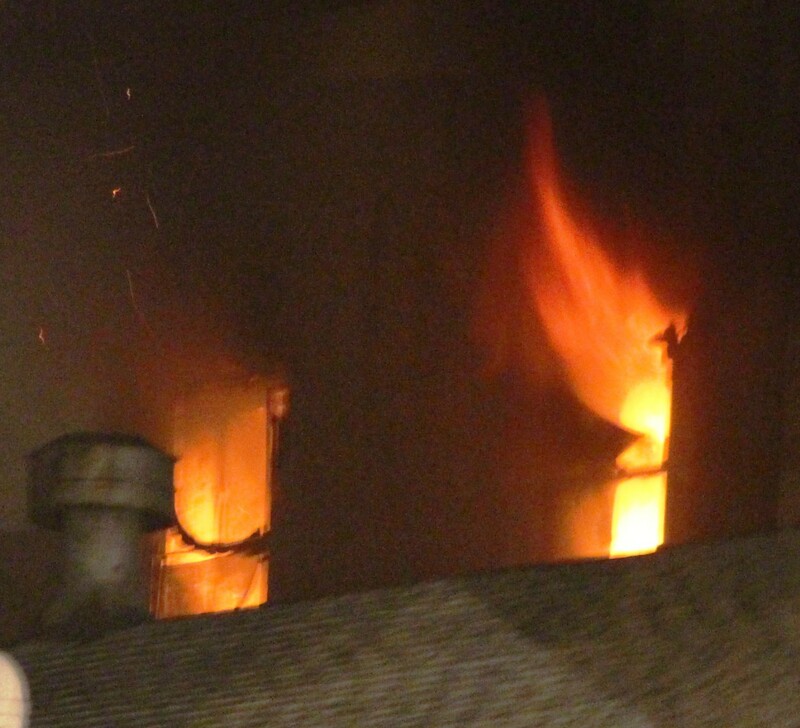 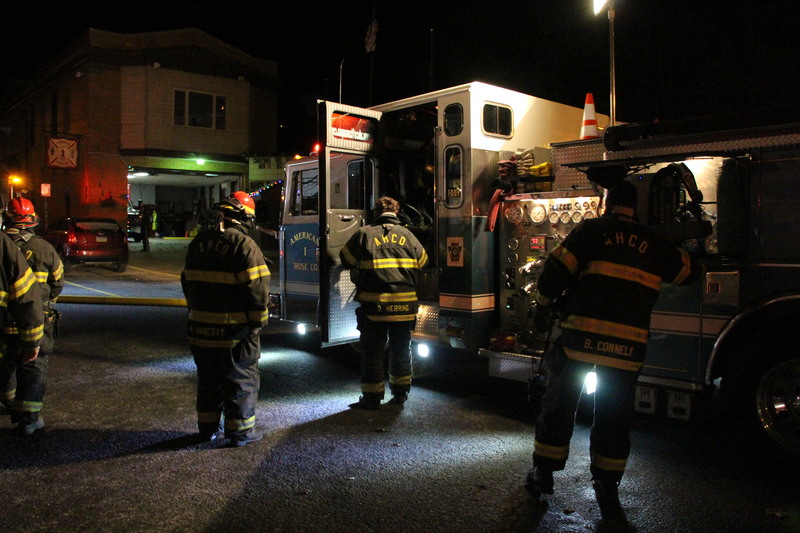 Emergency personnel were dispatched at 1:45 AM to 43-45 West Broad Street (US209) for an apartment dwelling fire. 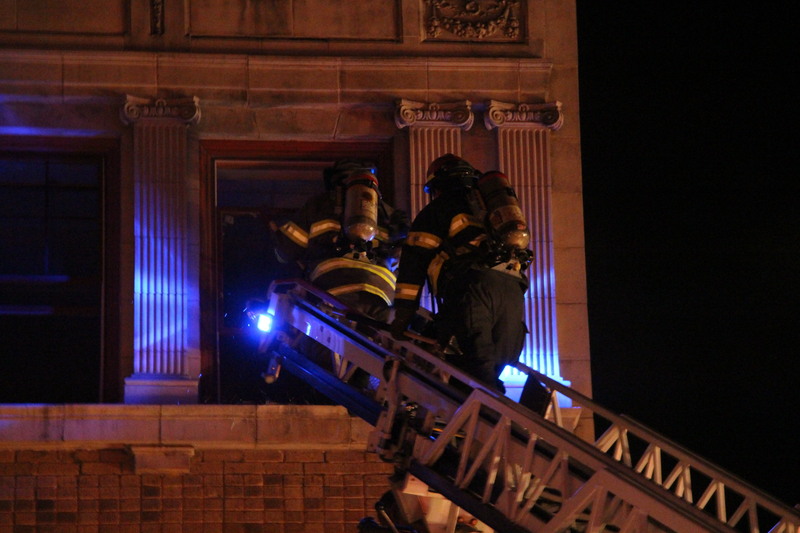 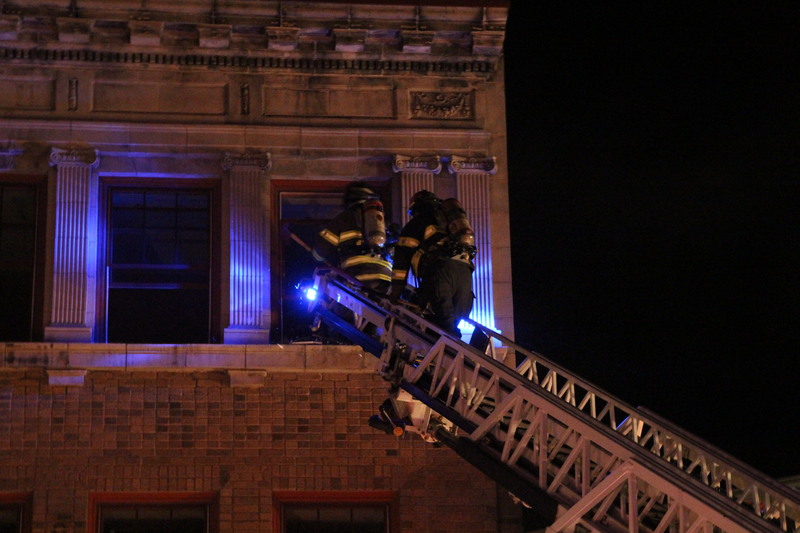 They arrived to see heavy smoke and ambers shooting from the rear top of the building. 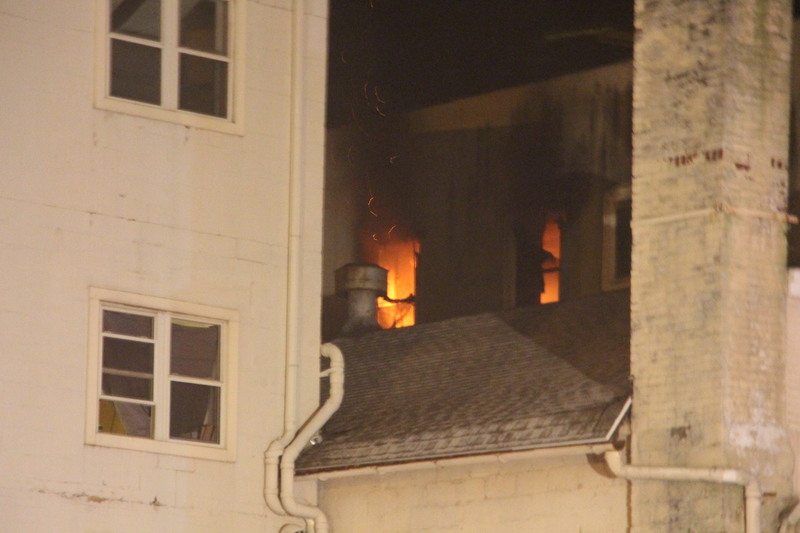 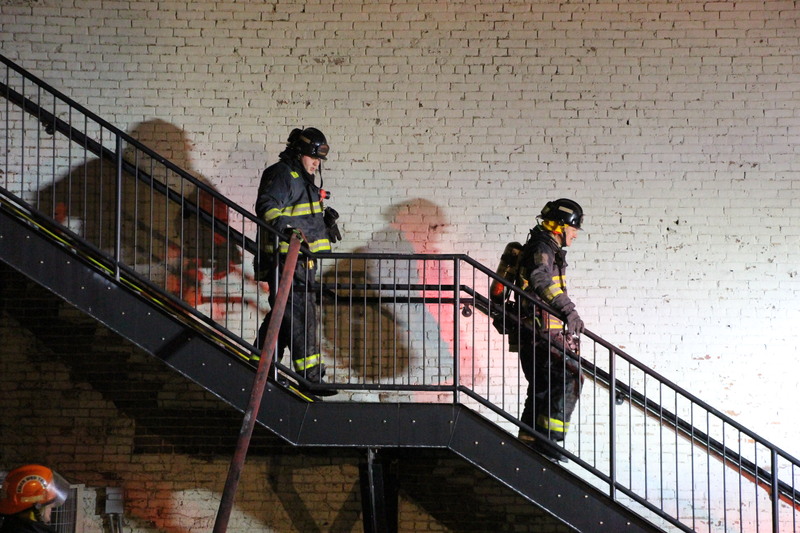 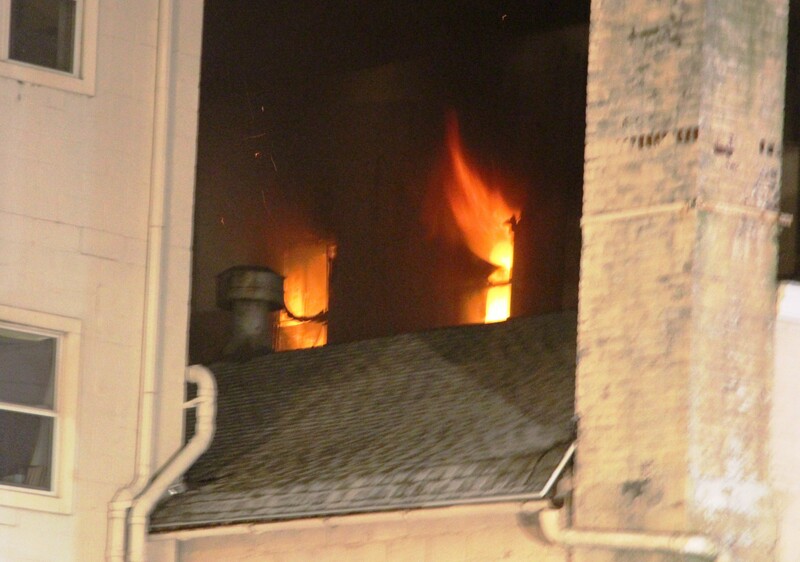 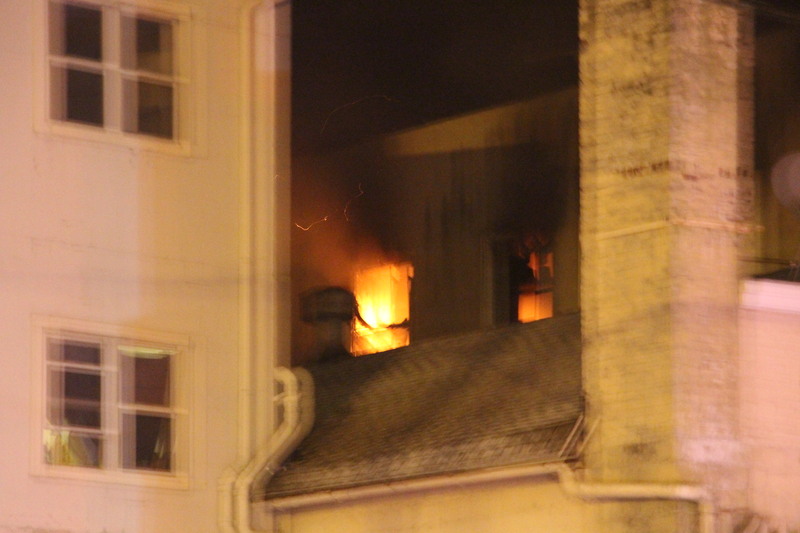 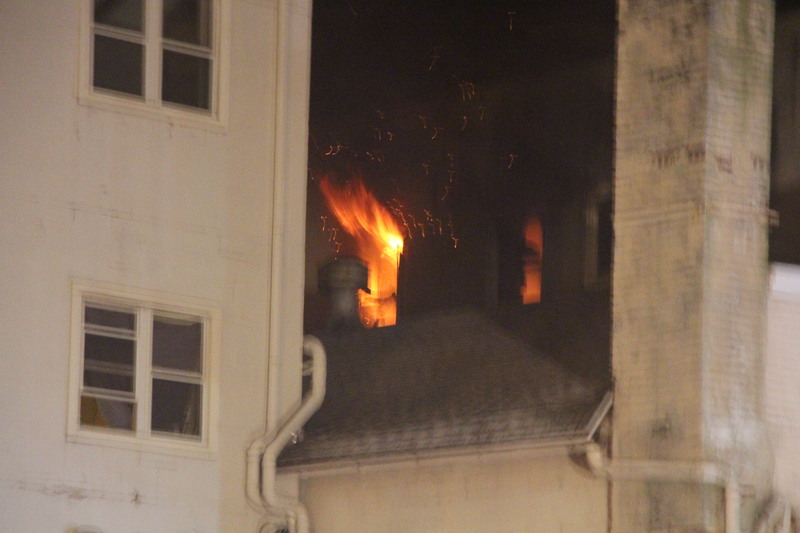 Shortly after, flames could be seen shooting out of two east-facing fourth floor windows. 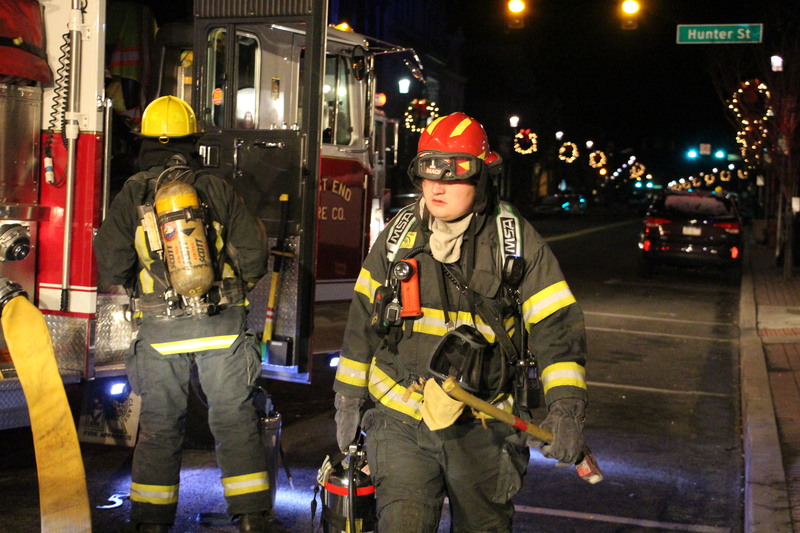 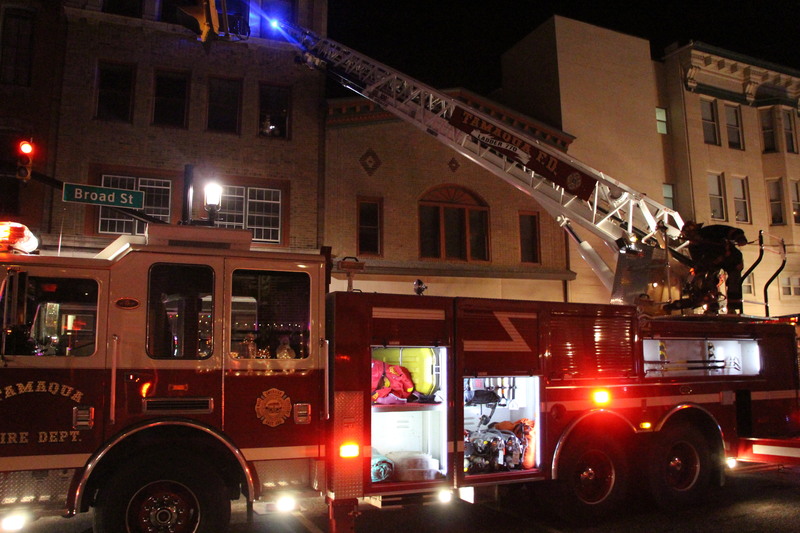 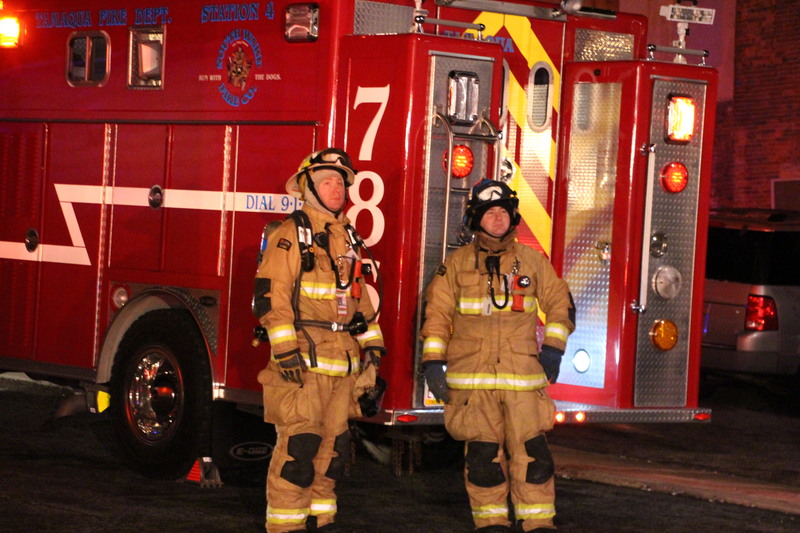 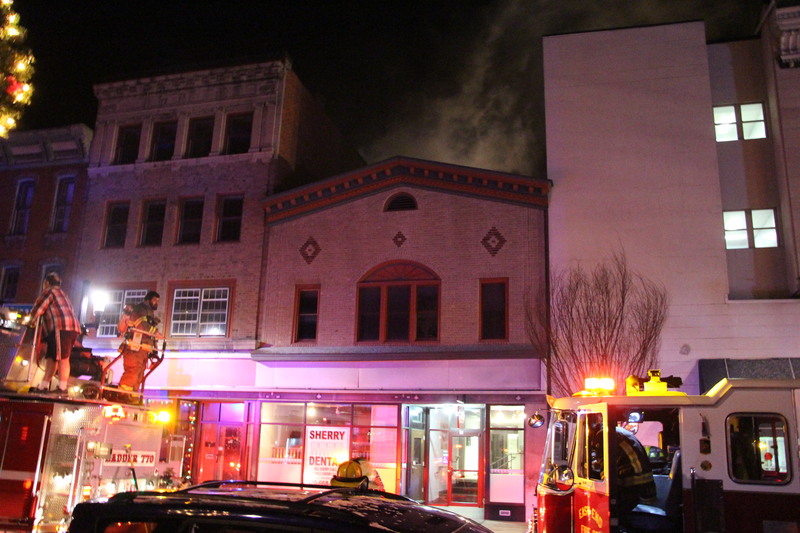 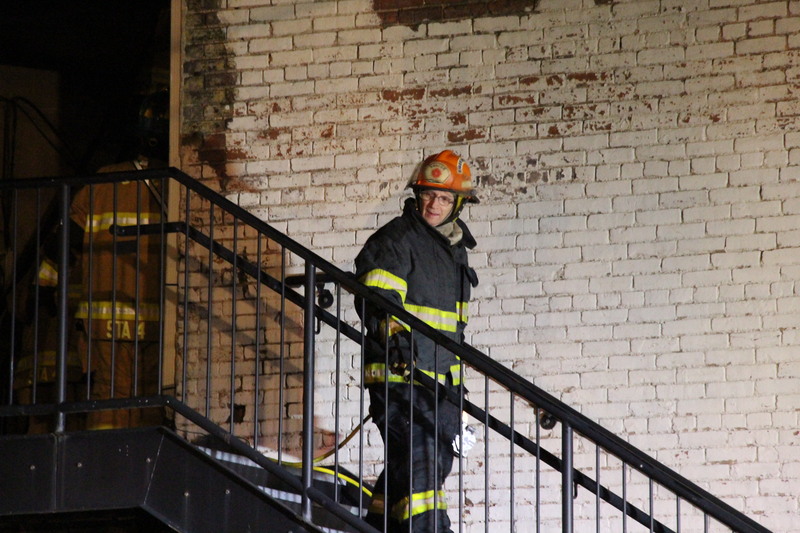 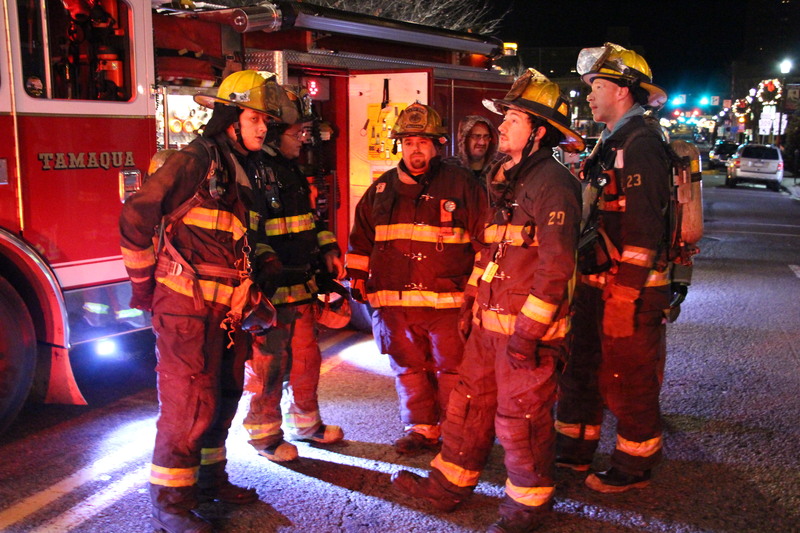 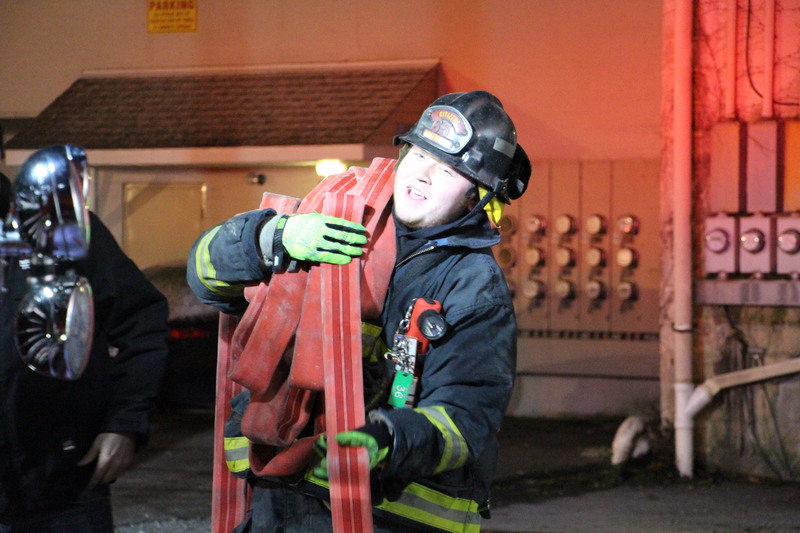 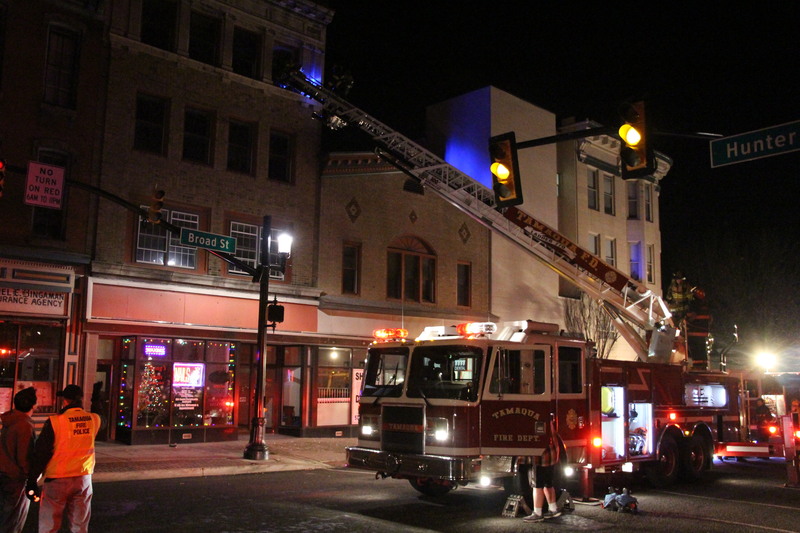 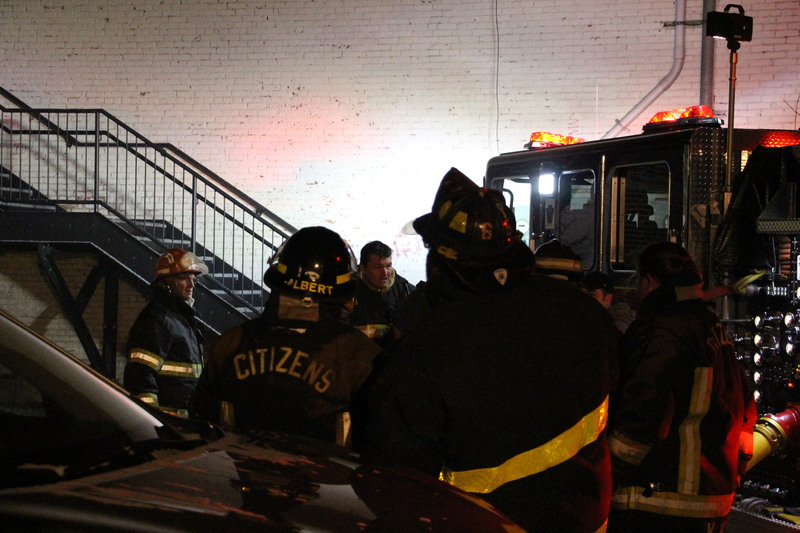 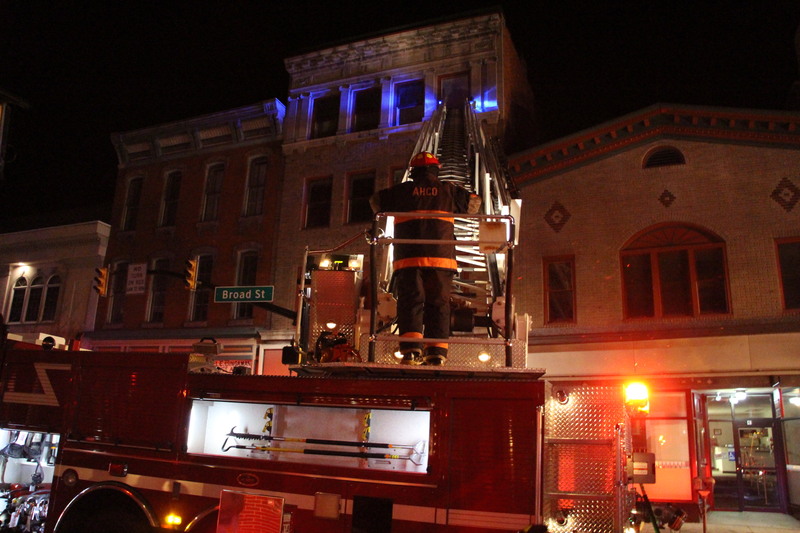 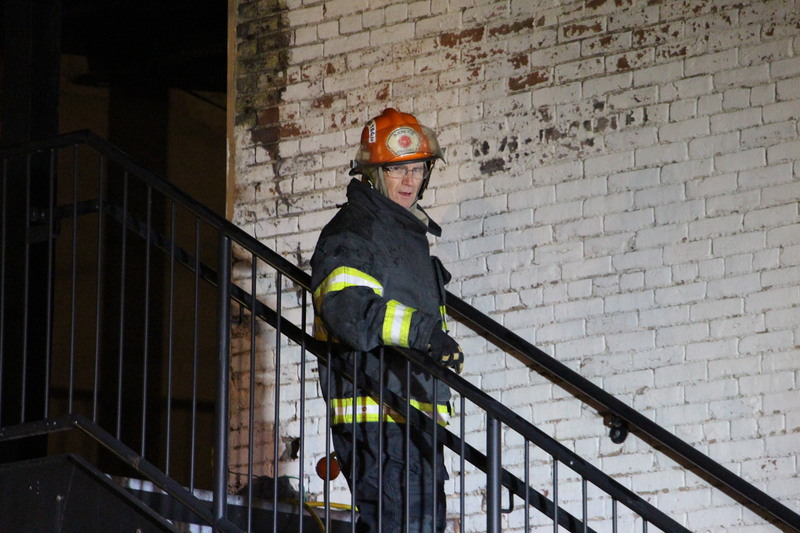 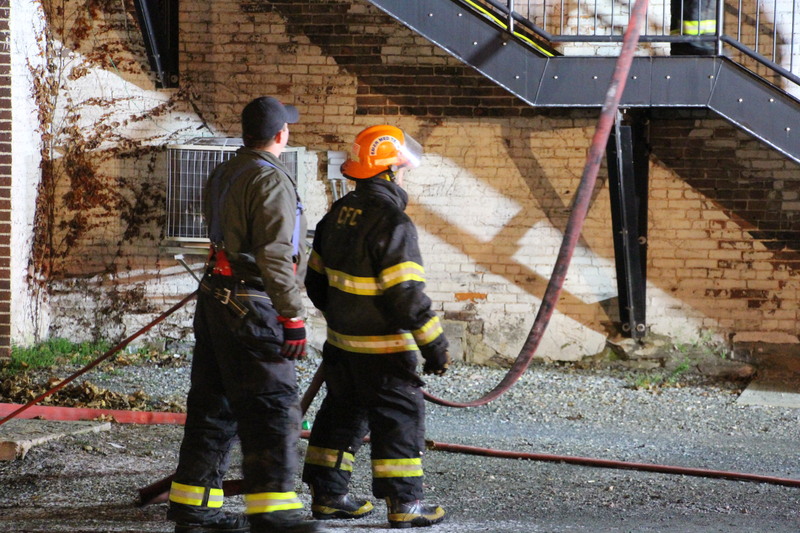 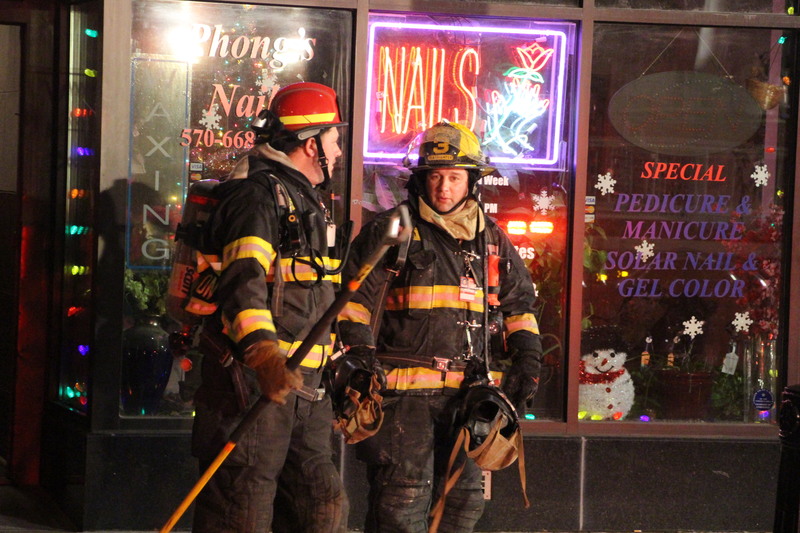 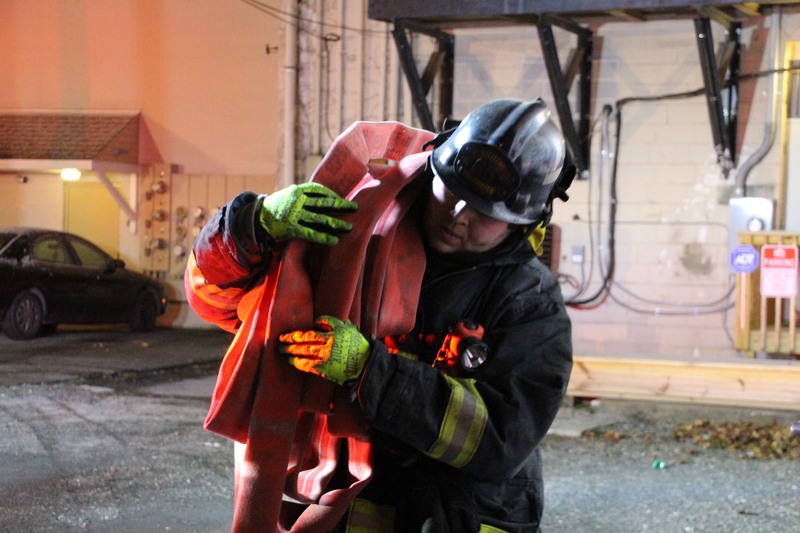 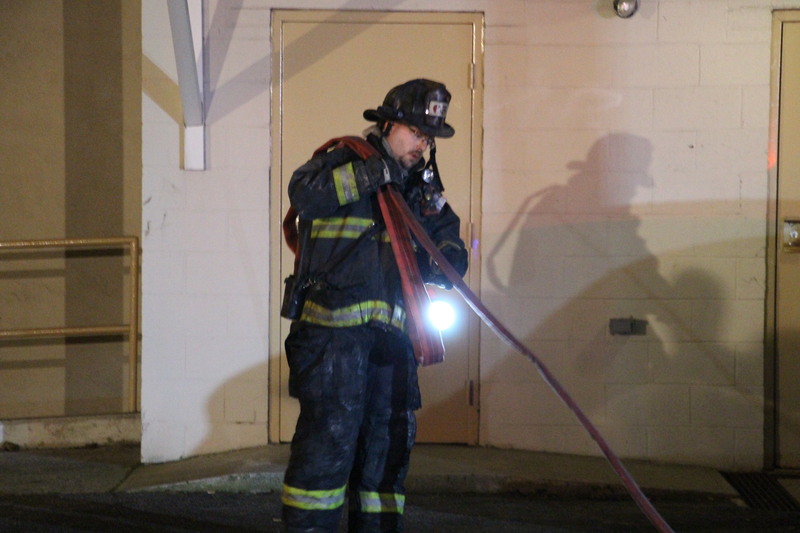 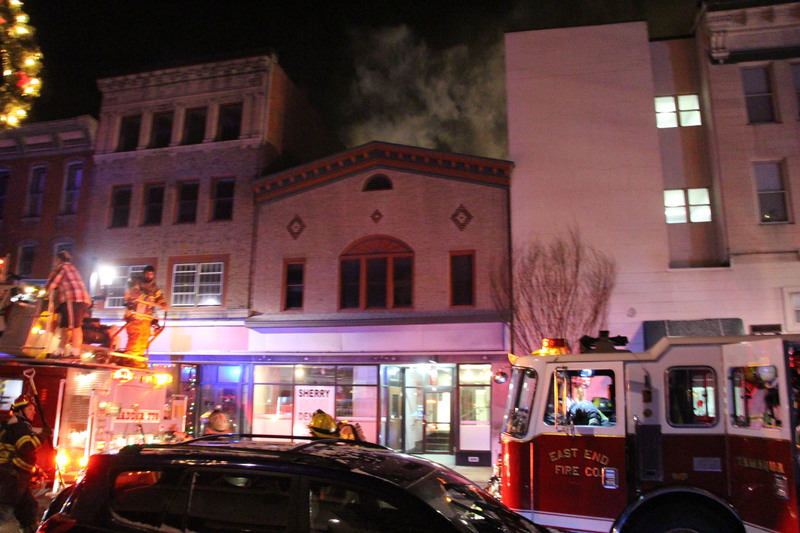 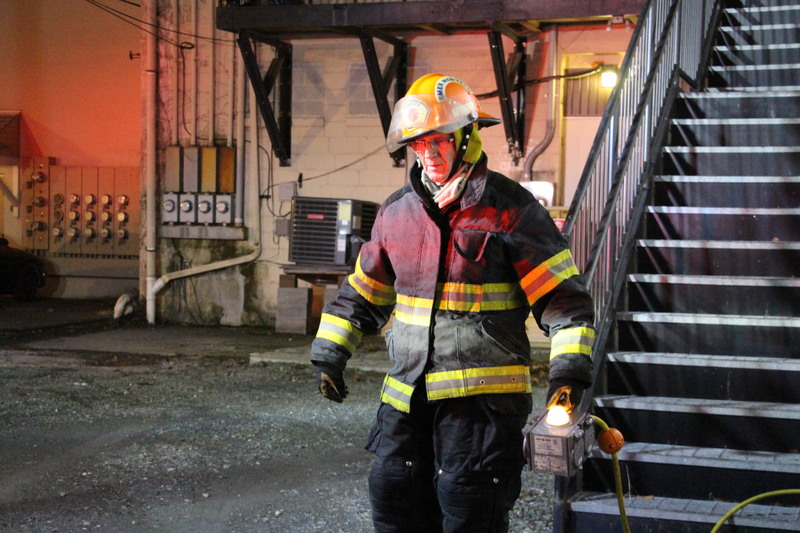 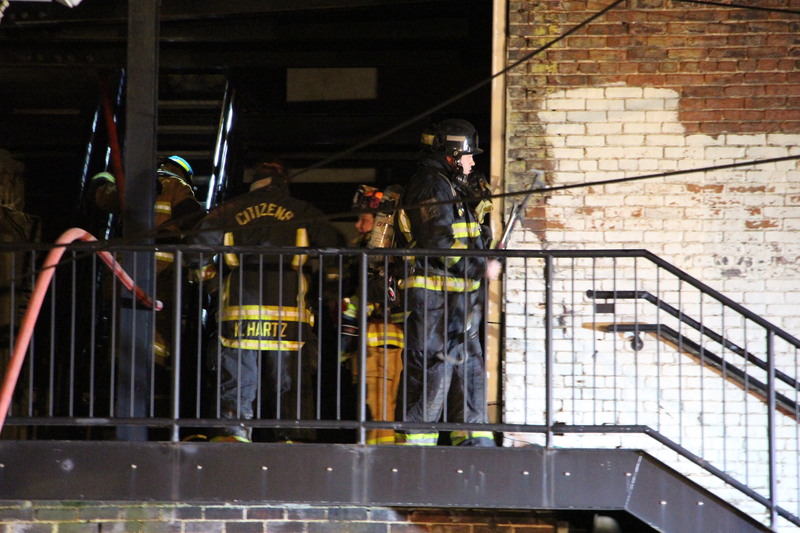 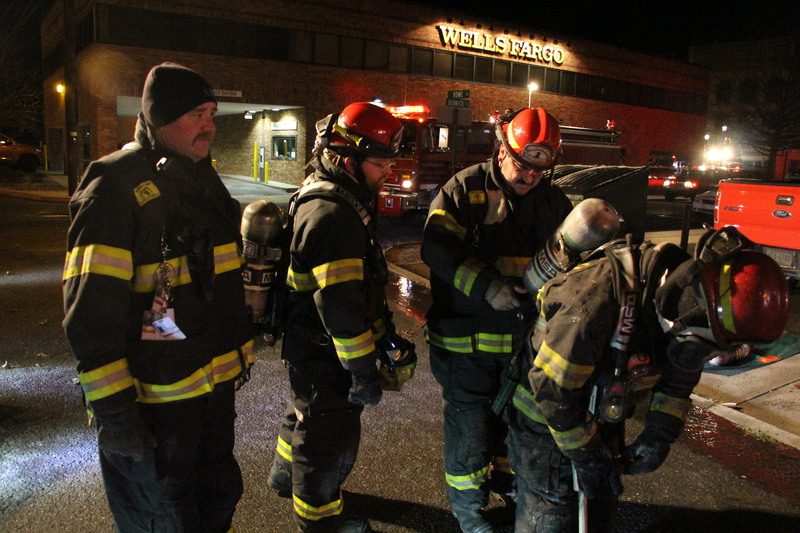 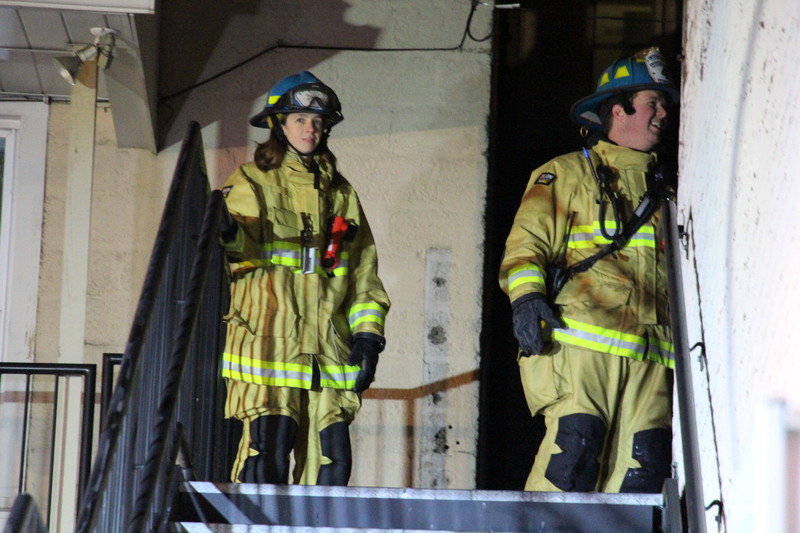 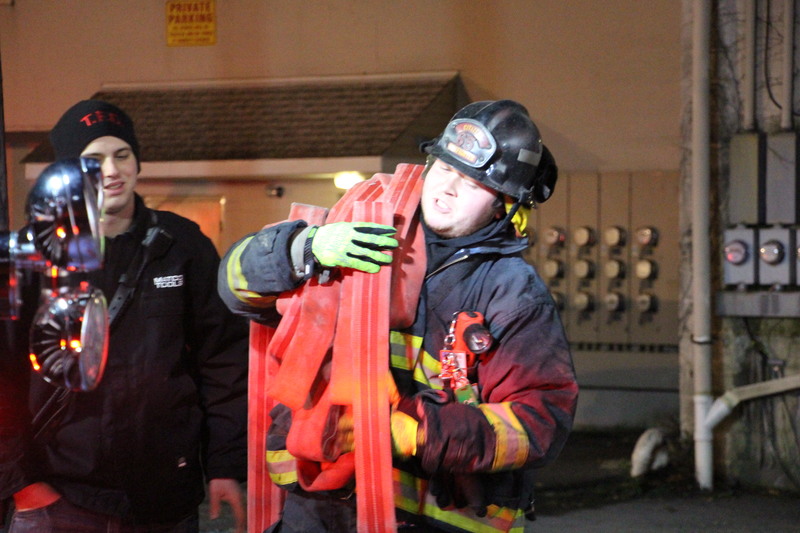 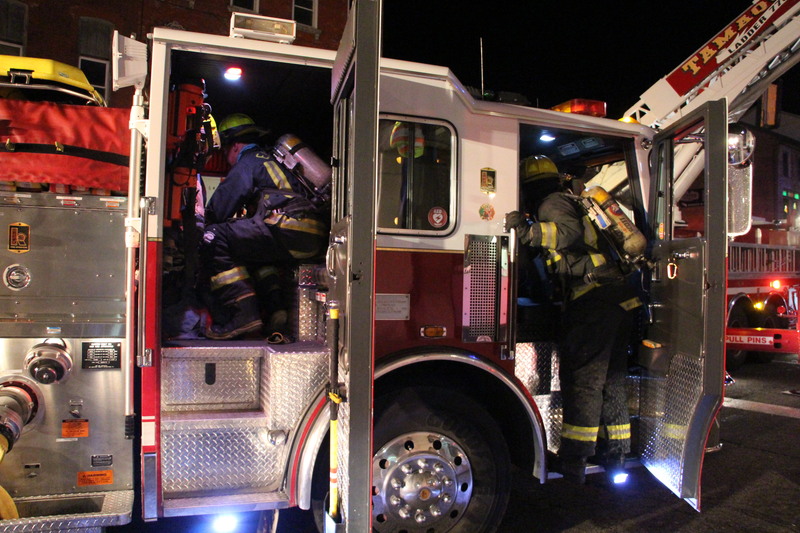 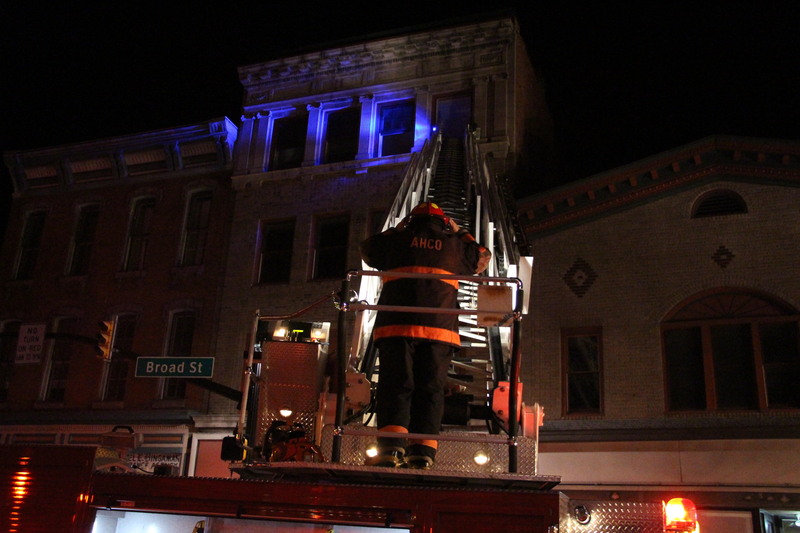 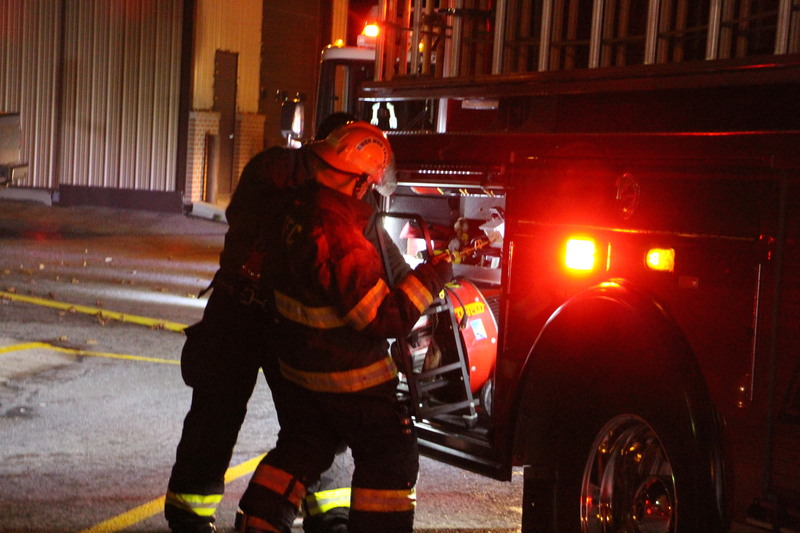 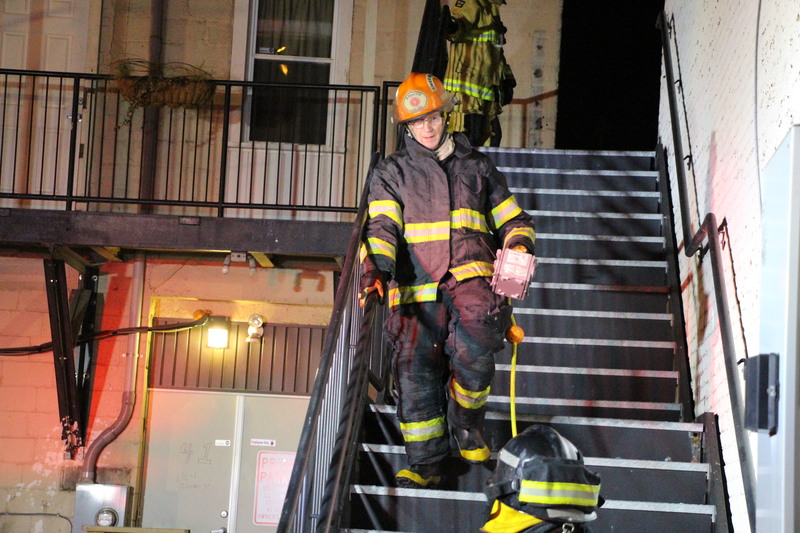 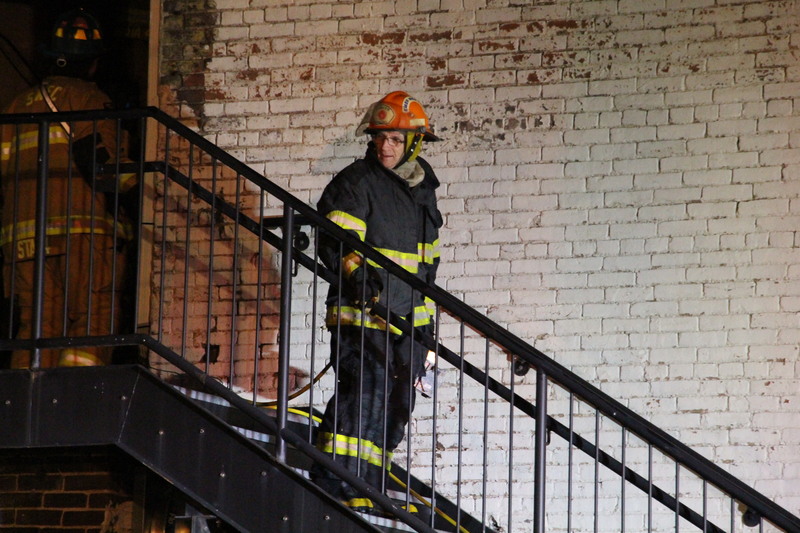 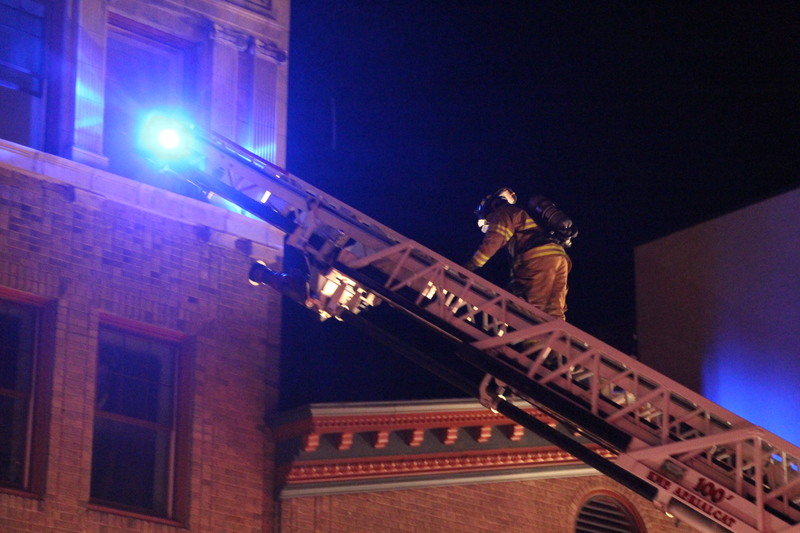 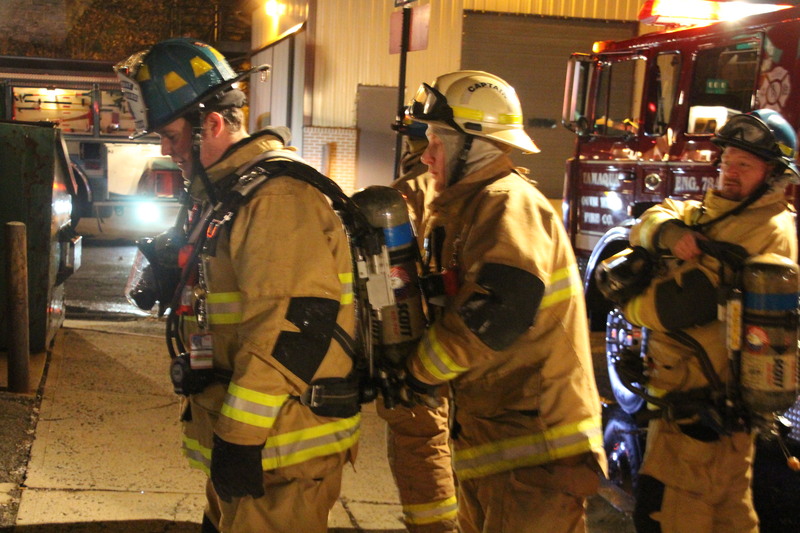 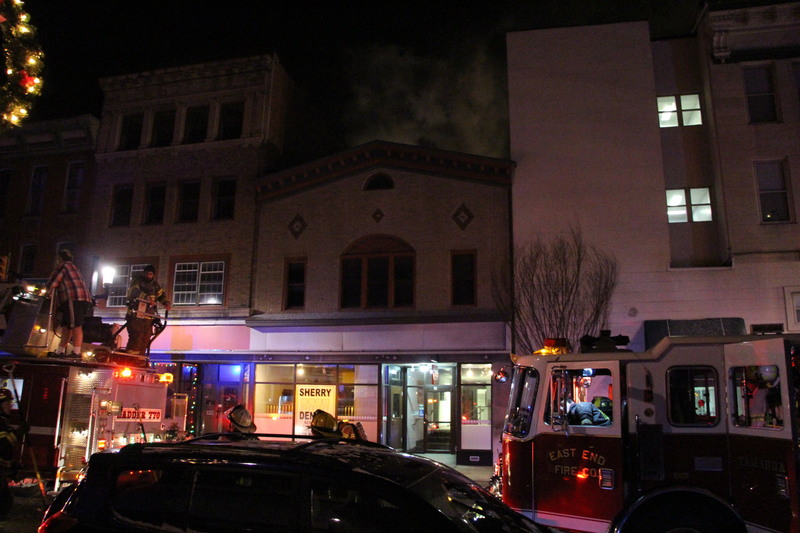 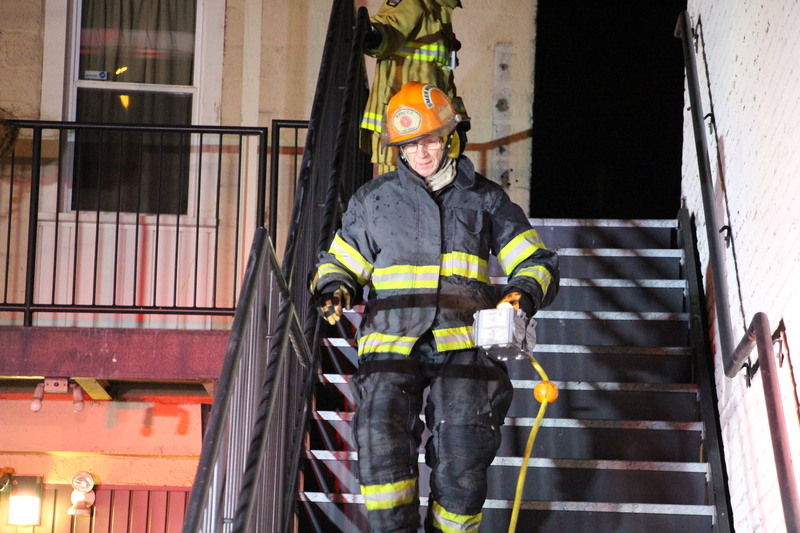 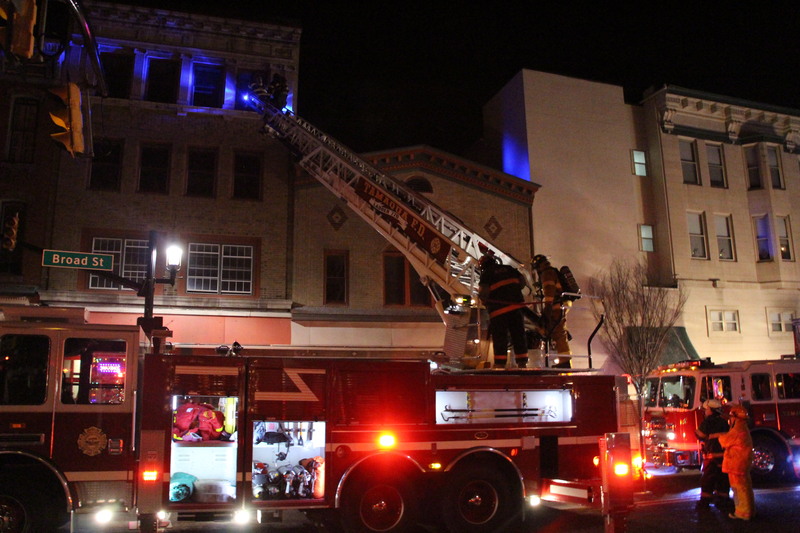 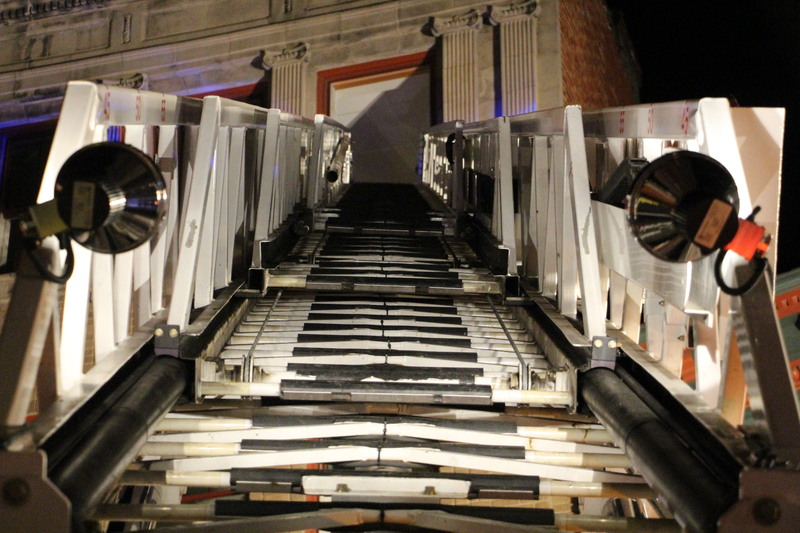 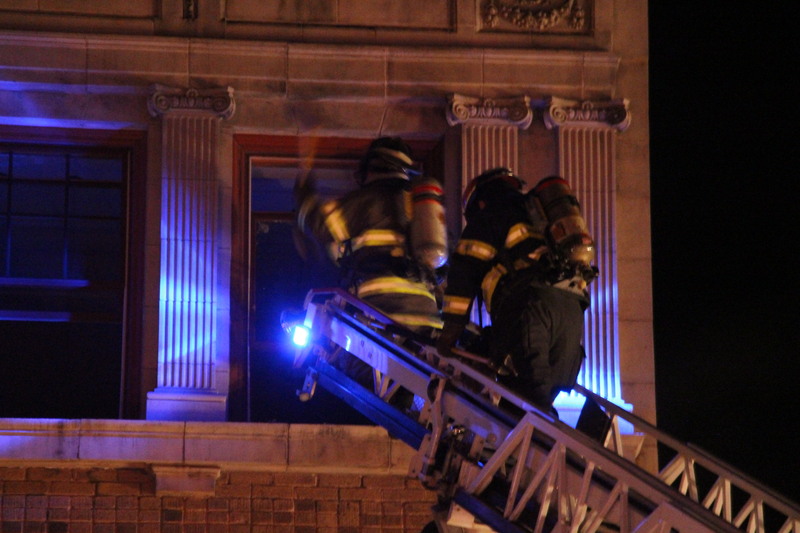 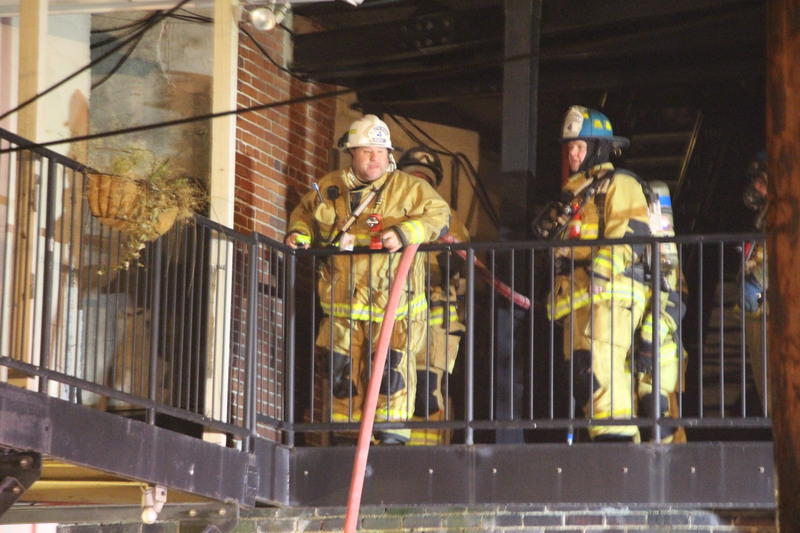 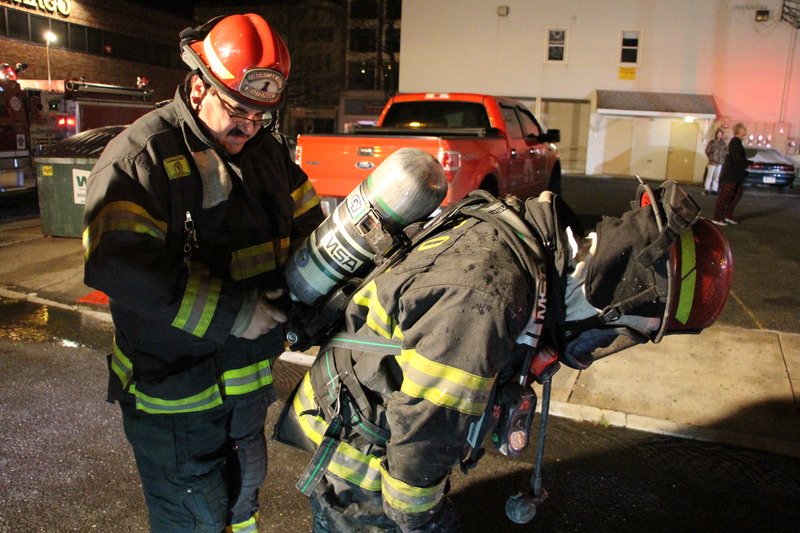 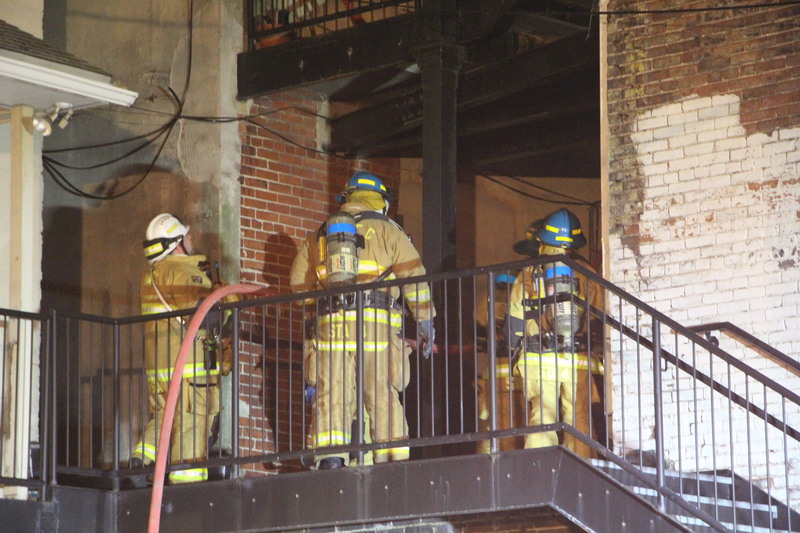 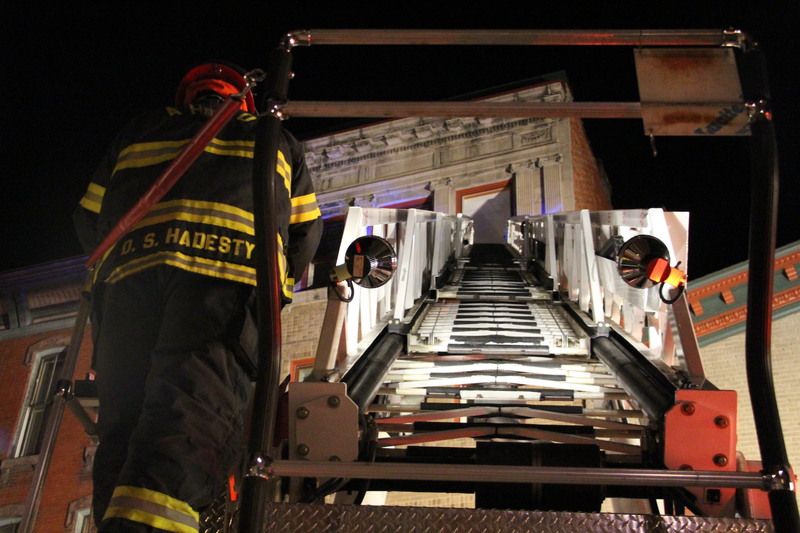 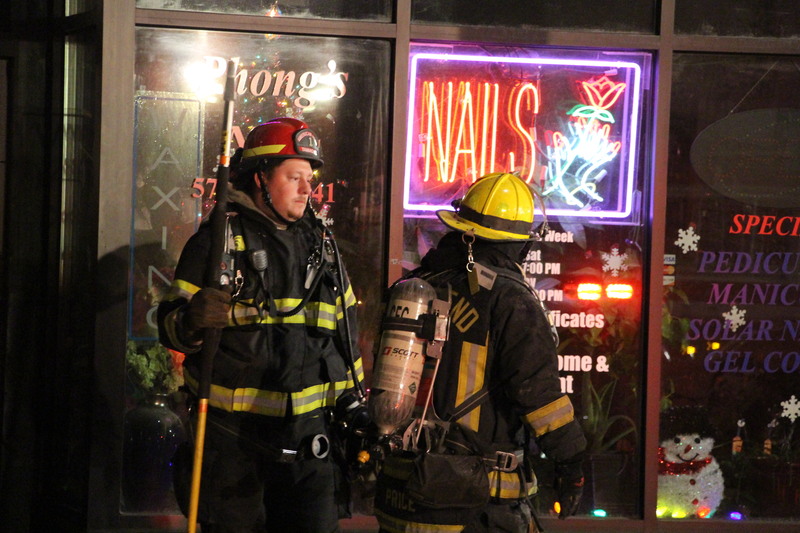 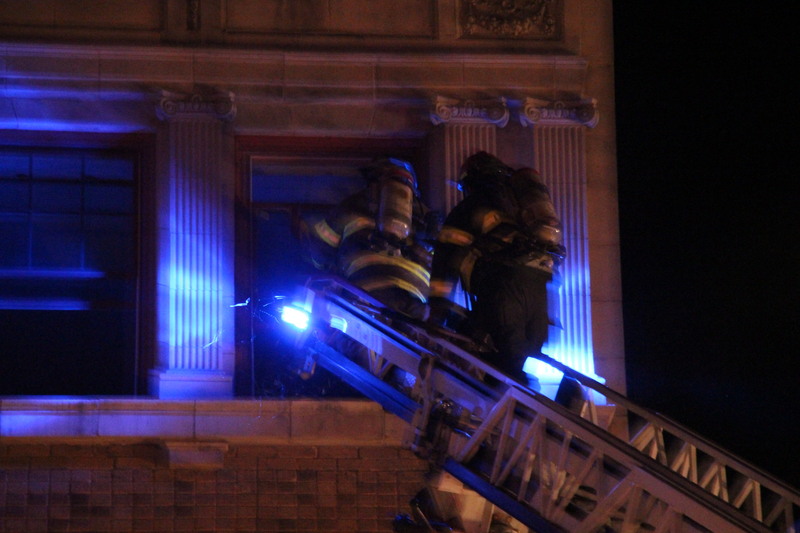 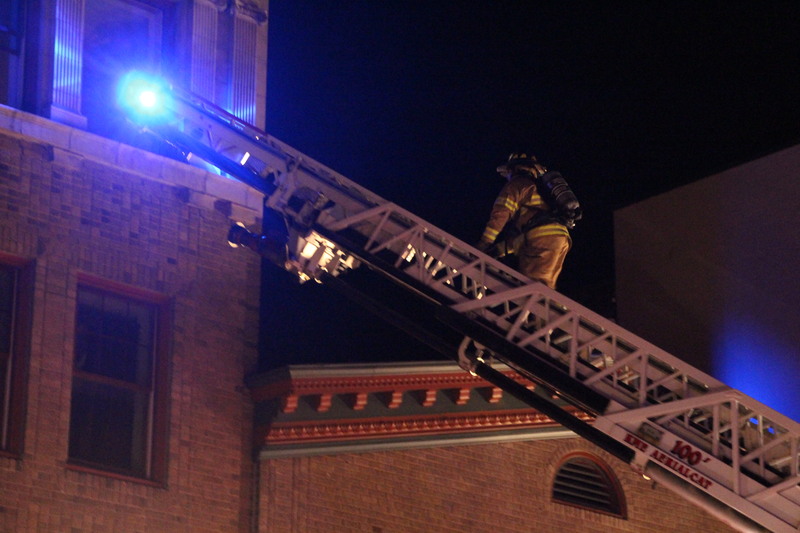 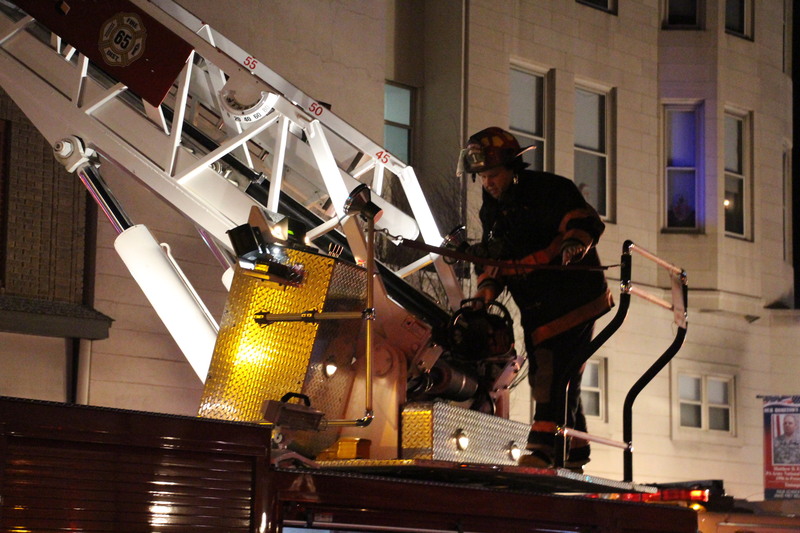 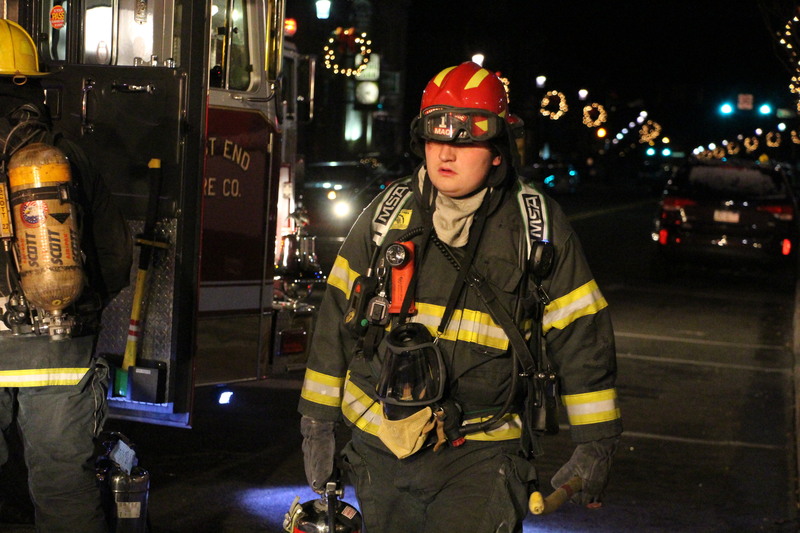 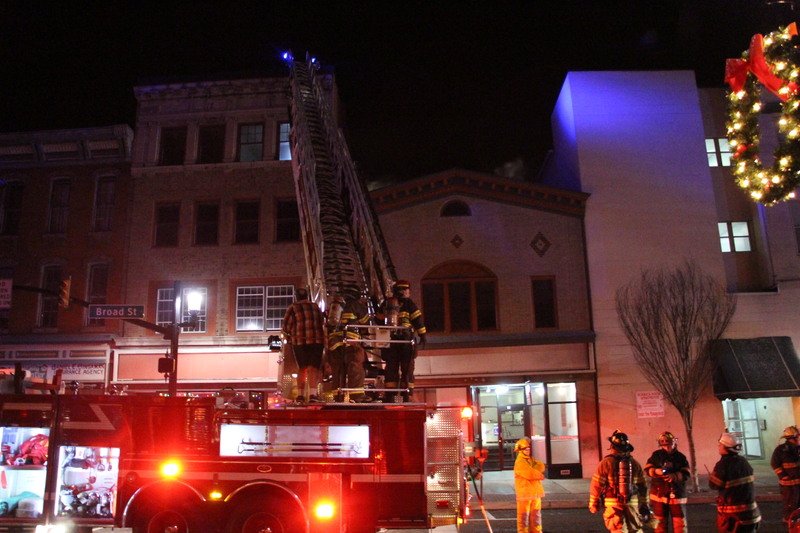 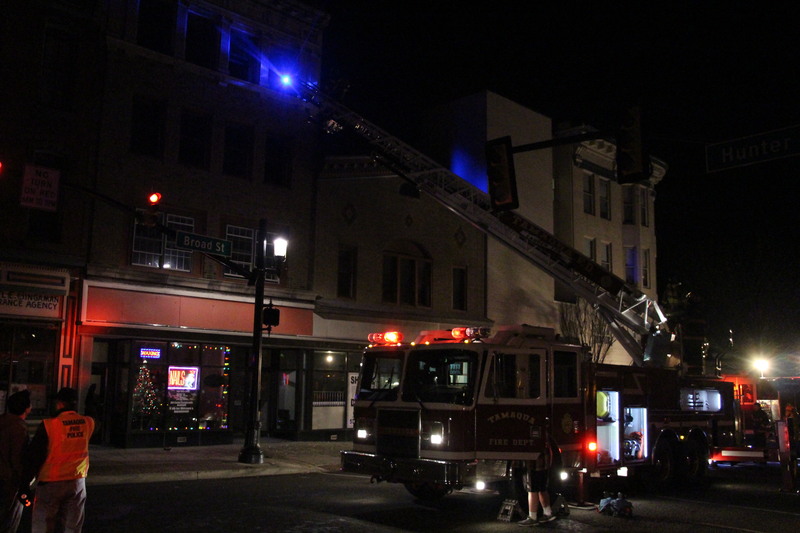 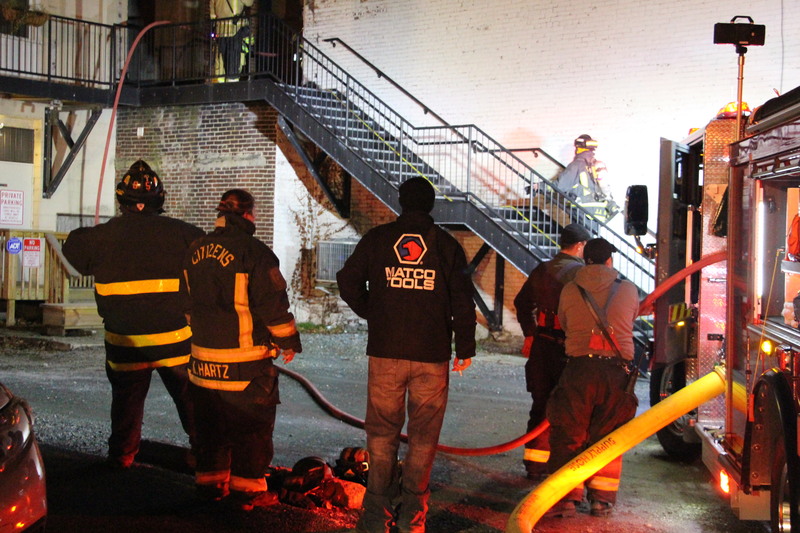 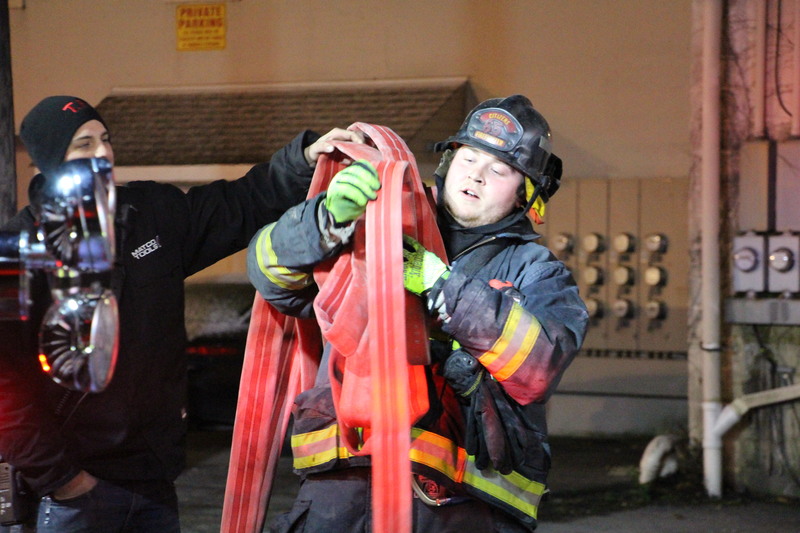 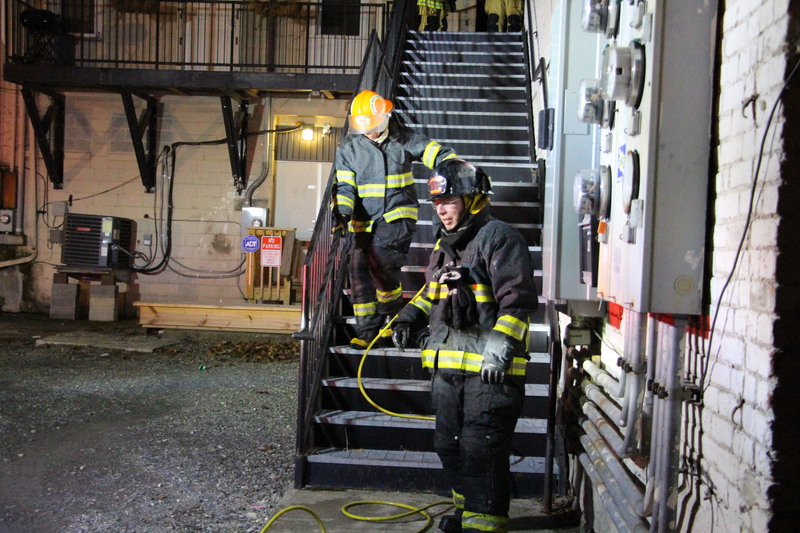 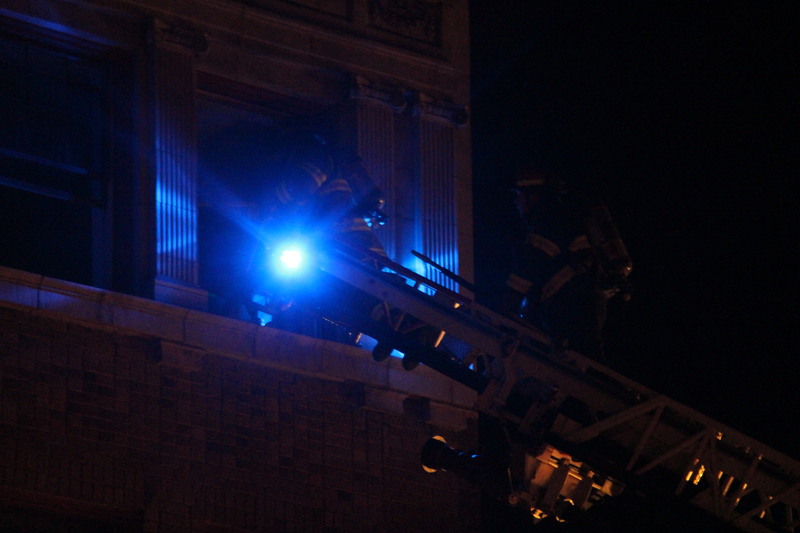 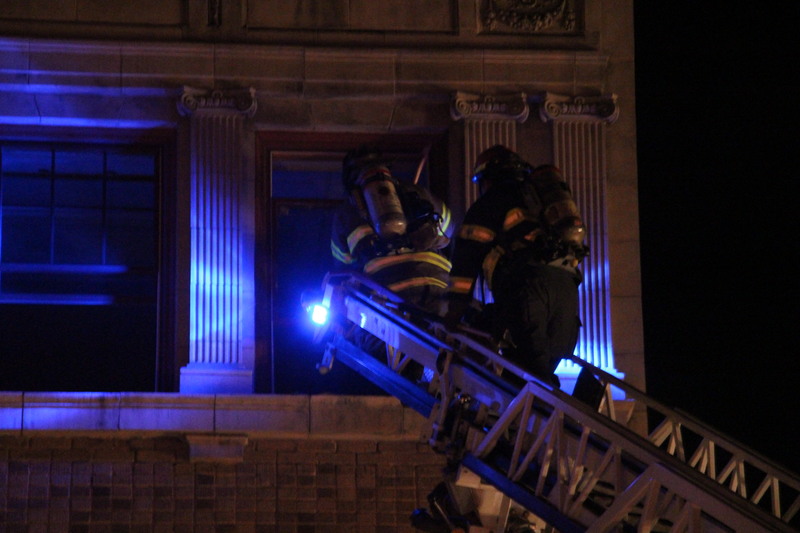 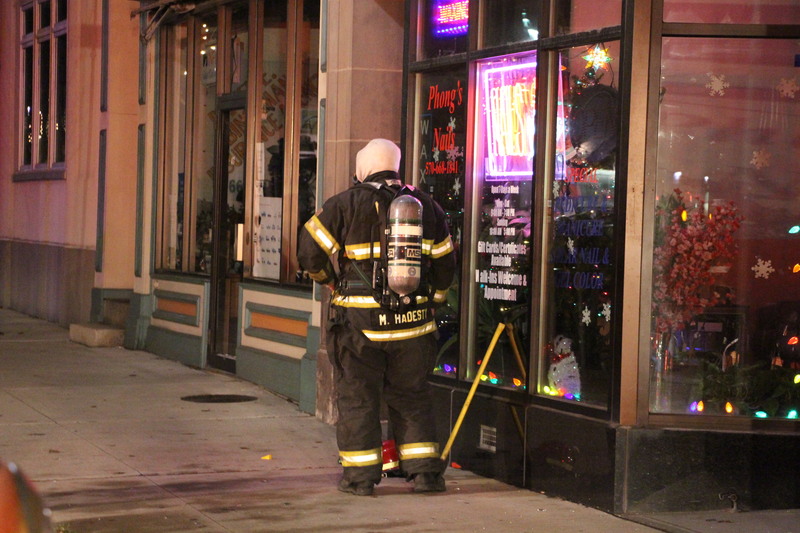 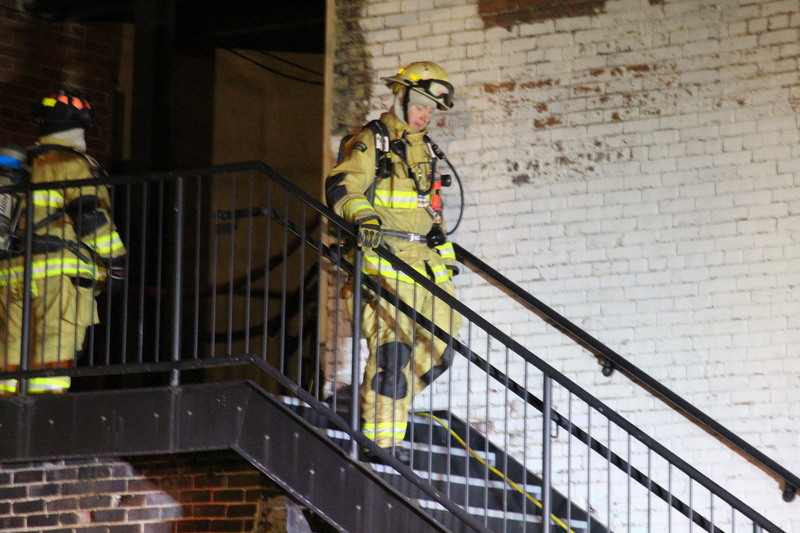 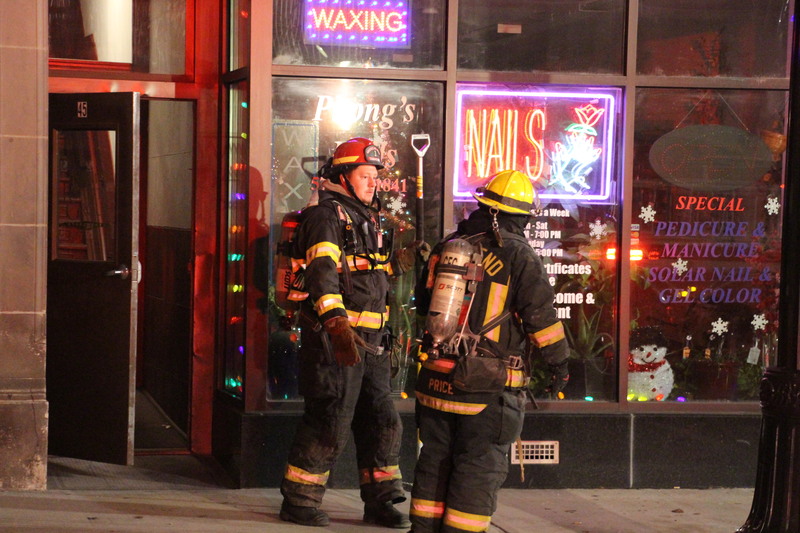 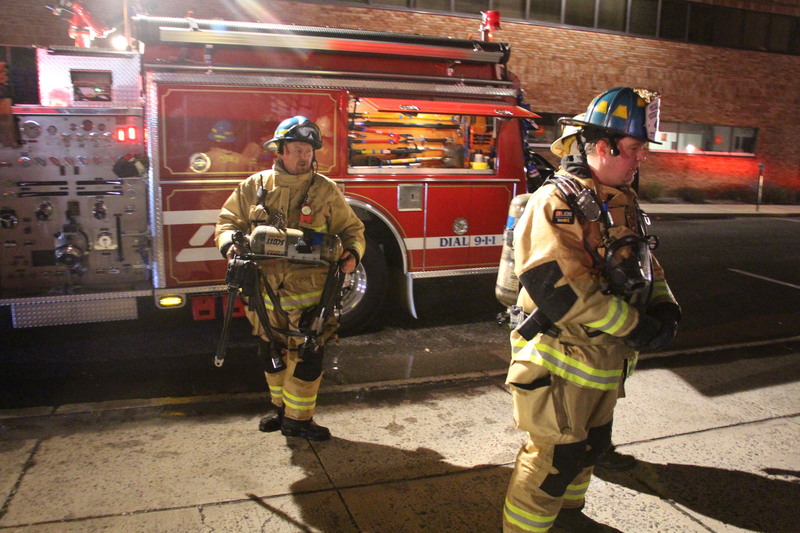 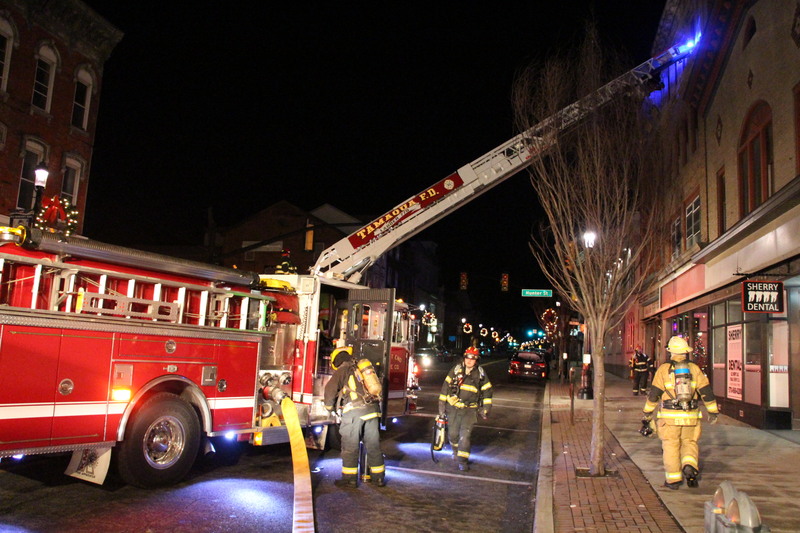 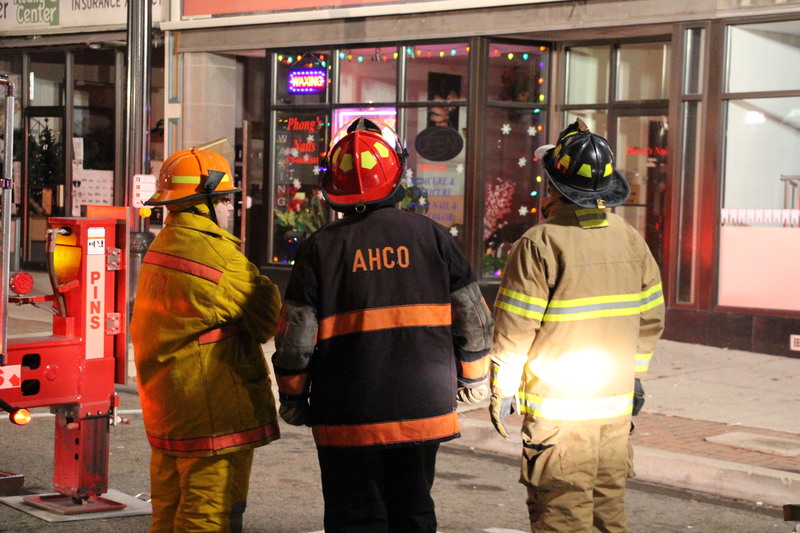 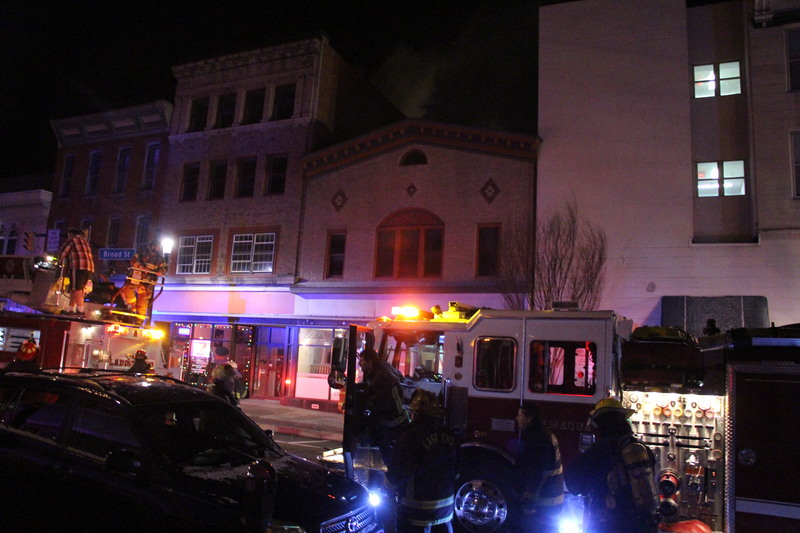 Firefighters, staged on West Broad Street, Berwick Street and West Rowe Street, were able to reach the flames in a short period of time and were able to prevent the fire from spreading to other downtown buildings. 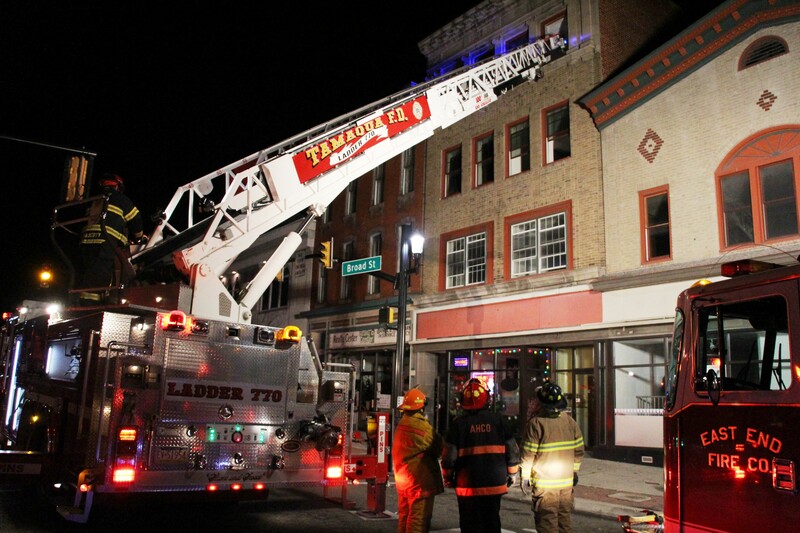 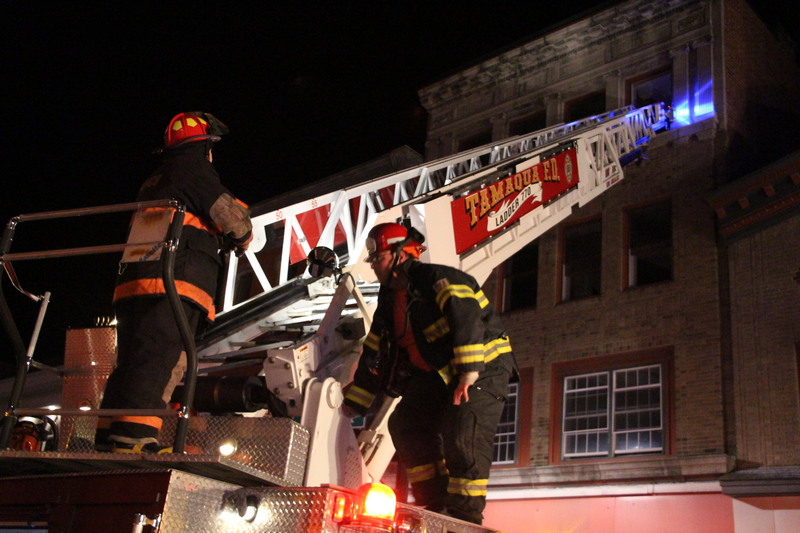 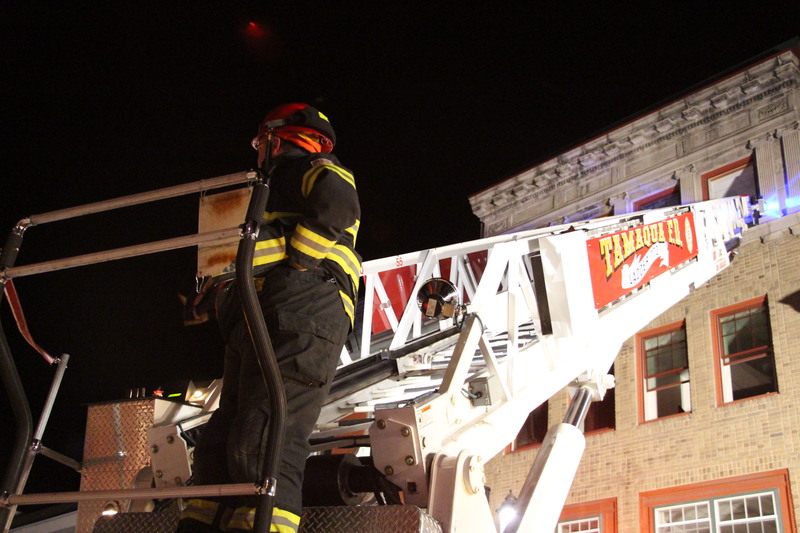 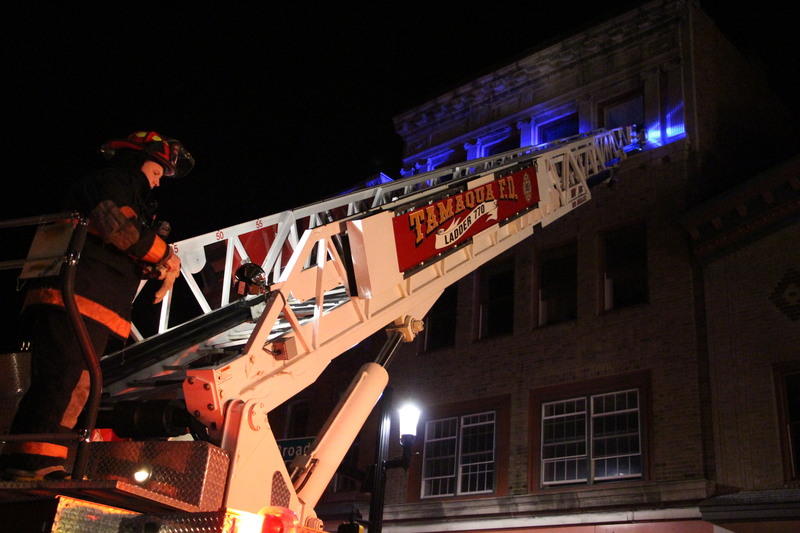 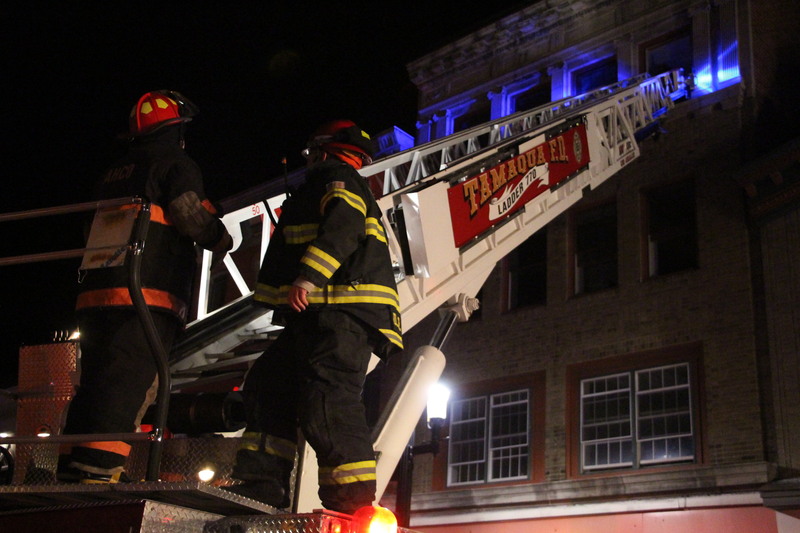 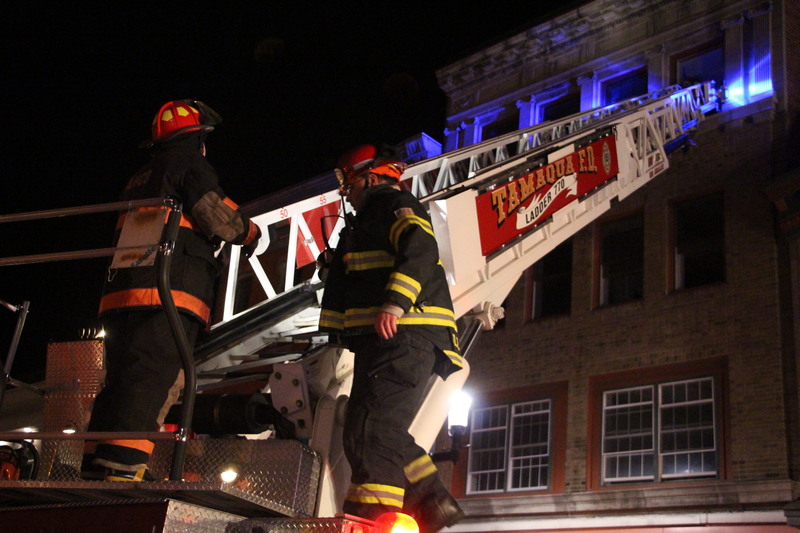 Tamaqua’s ladder truck was extended to front fourth floor, while firefighters worked to gain control of the fire on both fronts. 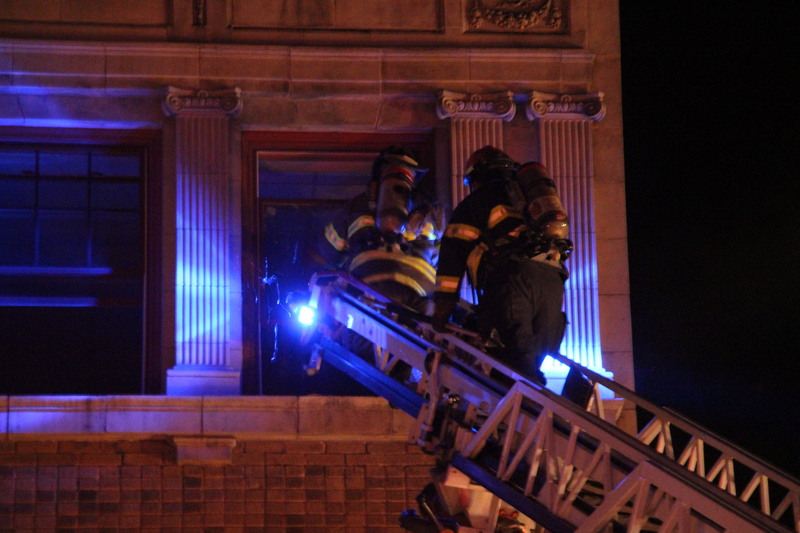 Firefighters on the ladder smashed the window to gain access. 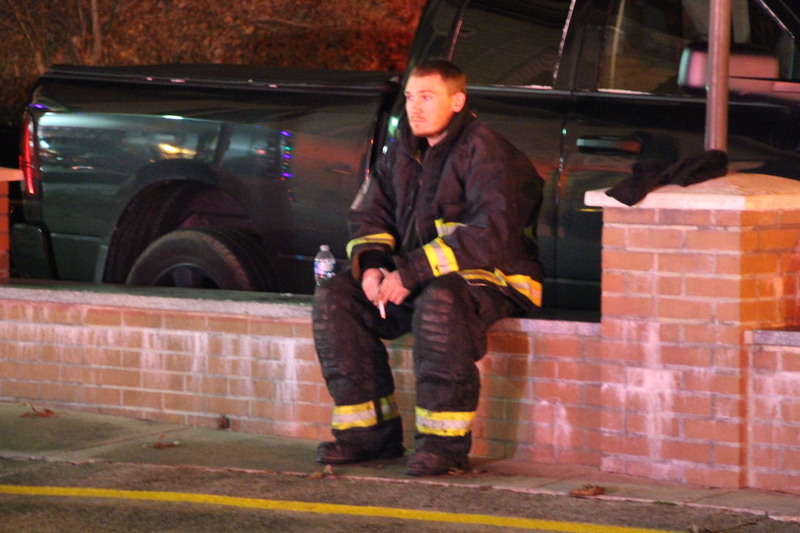 “At first, the police officer who responded and I saw a lot of smoke and ambers. 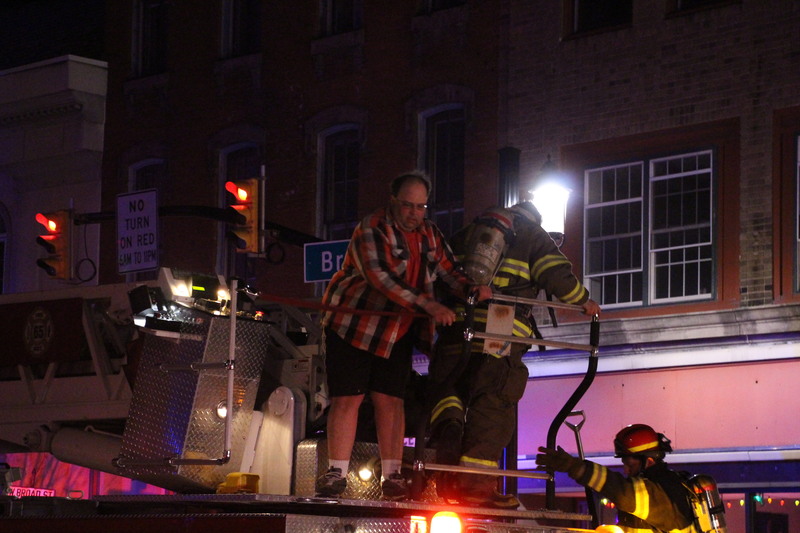 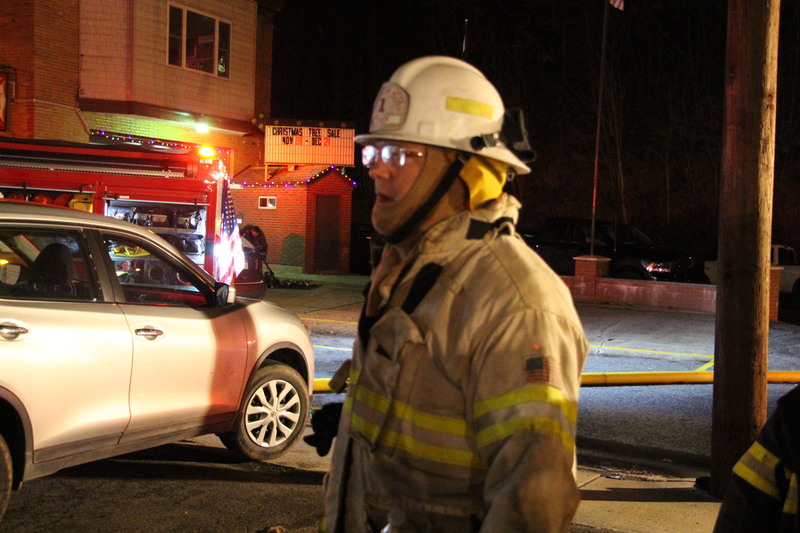 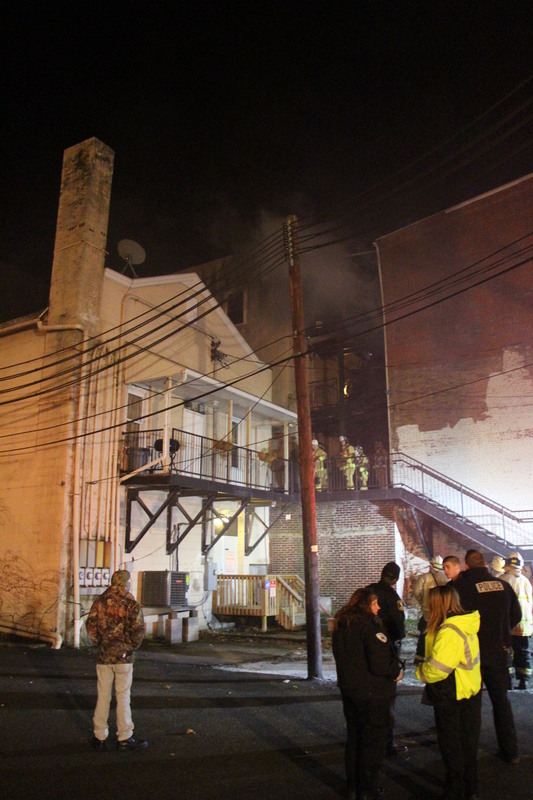 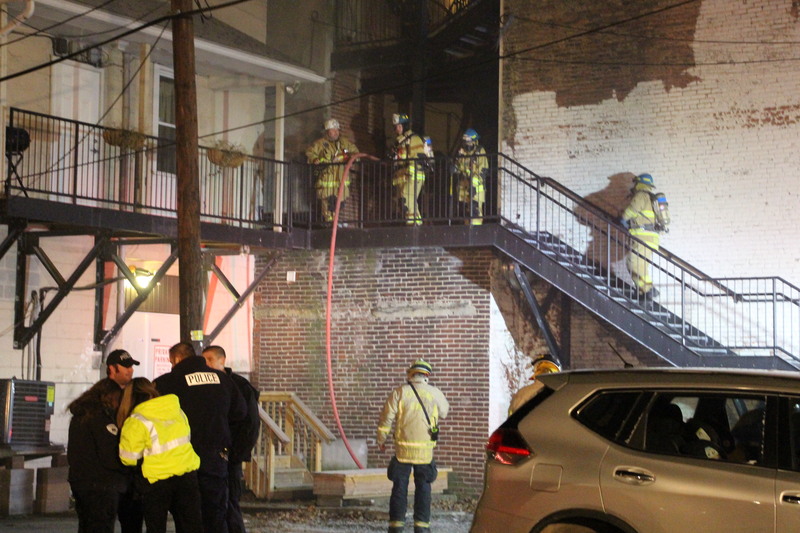 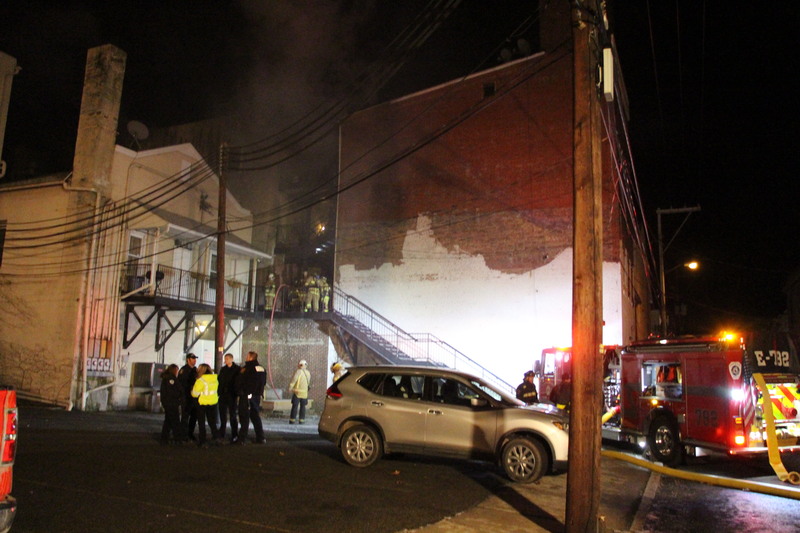 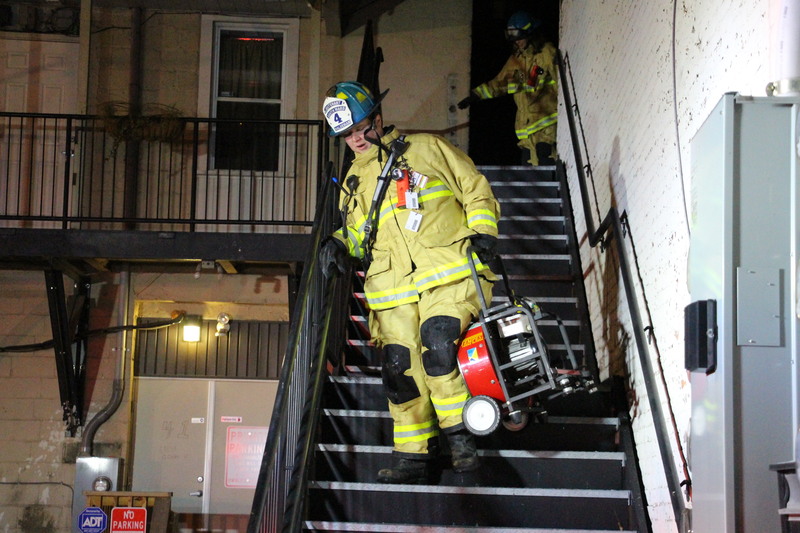 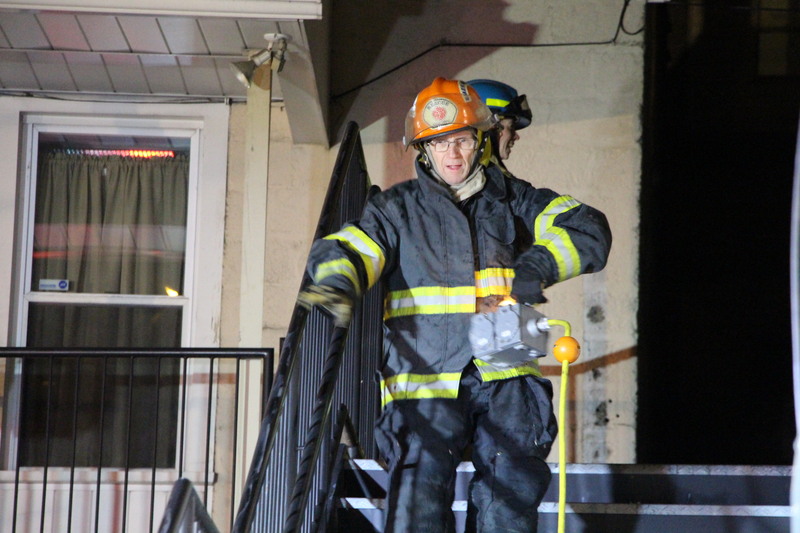 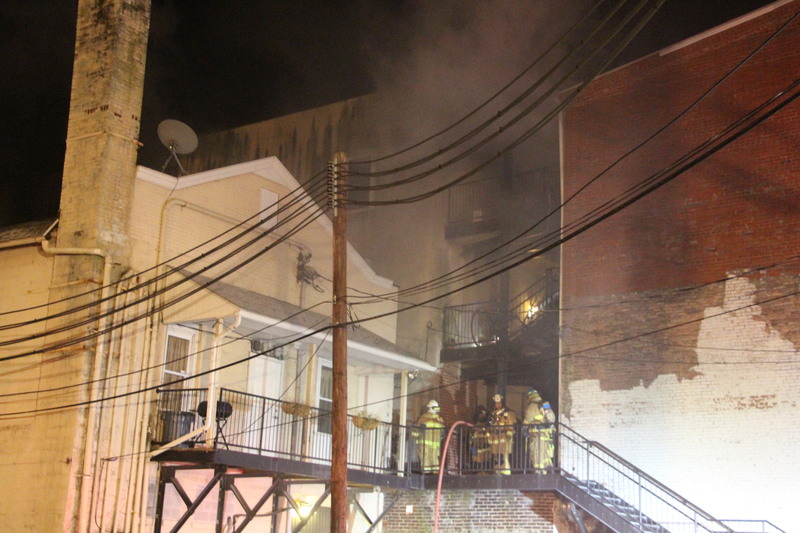 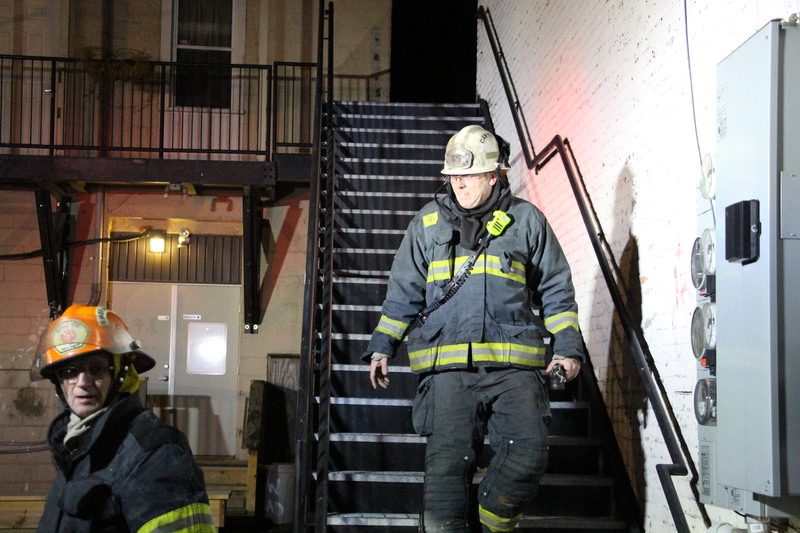 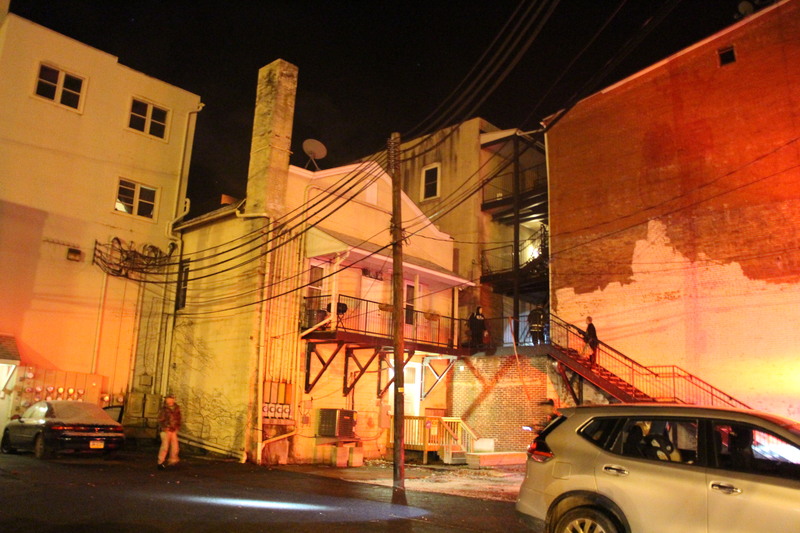 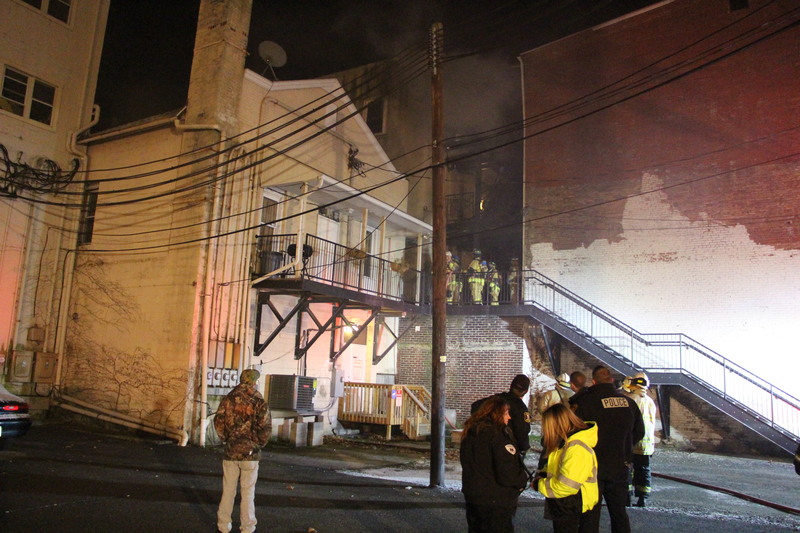 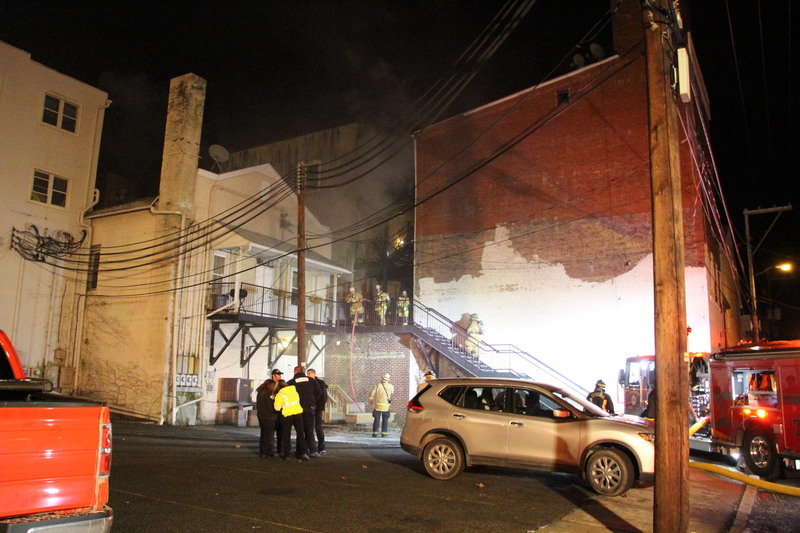 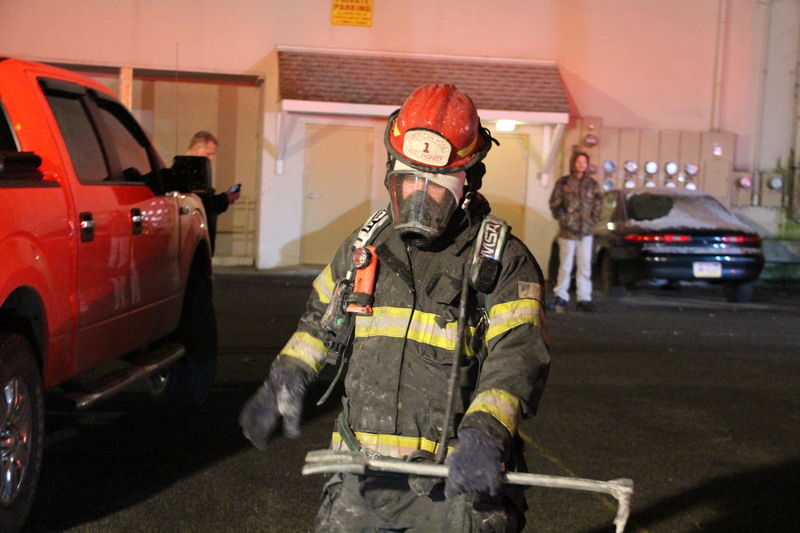 Then flames started shooting out the windows of the apartment building,” said Tamaqua resident John Filer who was walking his dog on along East Rowe Street when he smelled smoke. 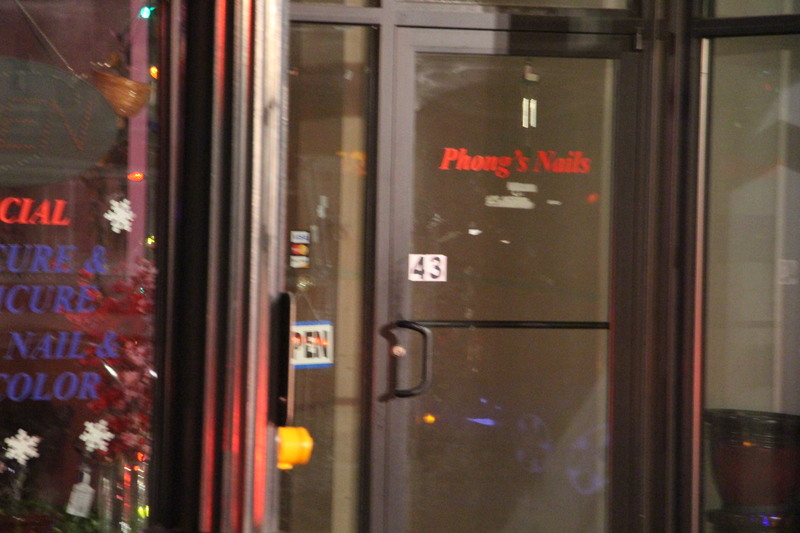 The building is home to Phong’s Nail Salon on the first floor, and has multiple apartments on the three upper floors. 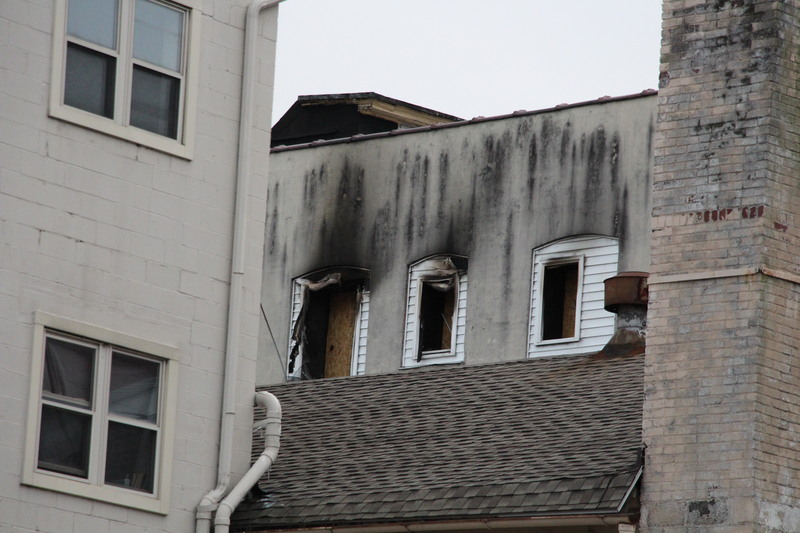 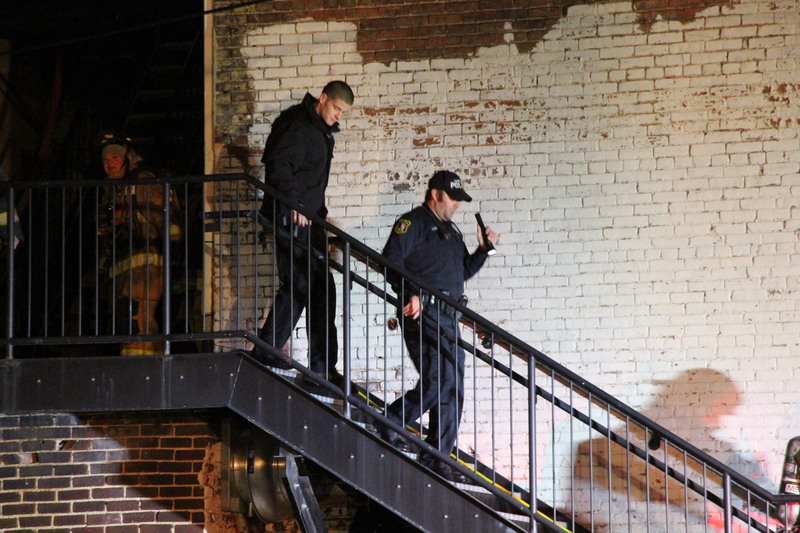 Unofficial information states that apartments on the second floor were occupied, but apartments on the third and fourth floor were vacant. 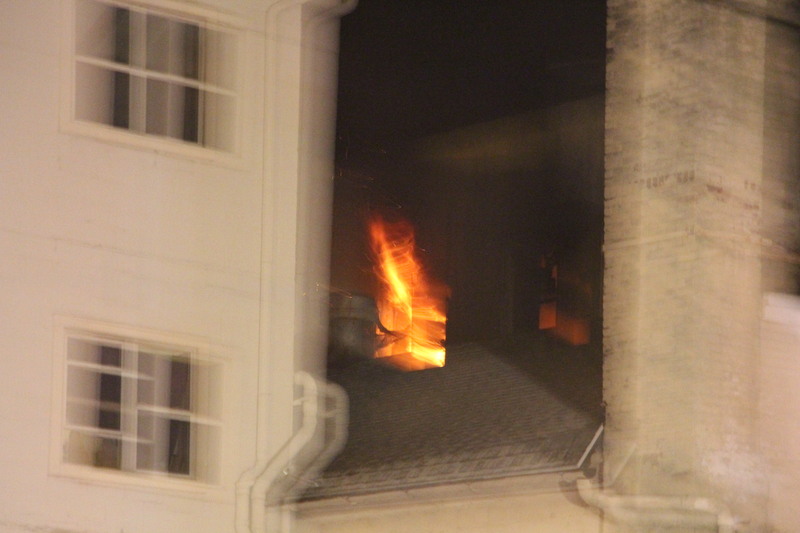 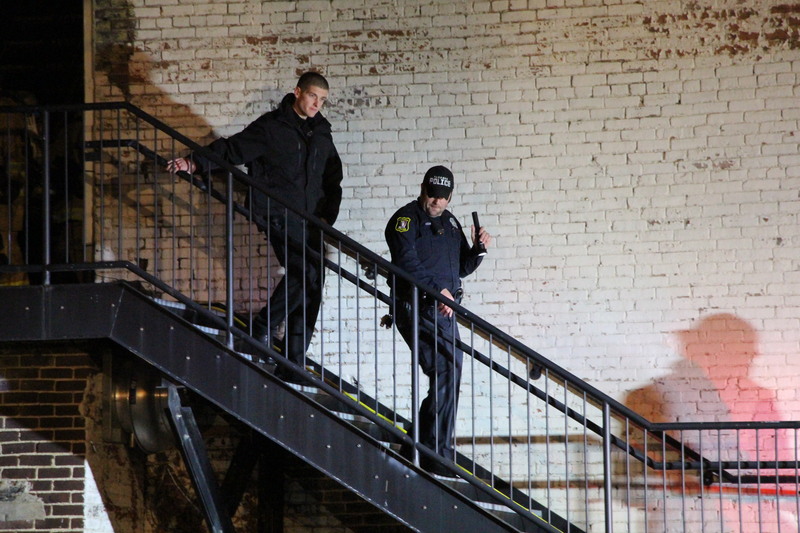 More information provided states that a man was said to have been evicted or chased from the upper floor two weeks ago. 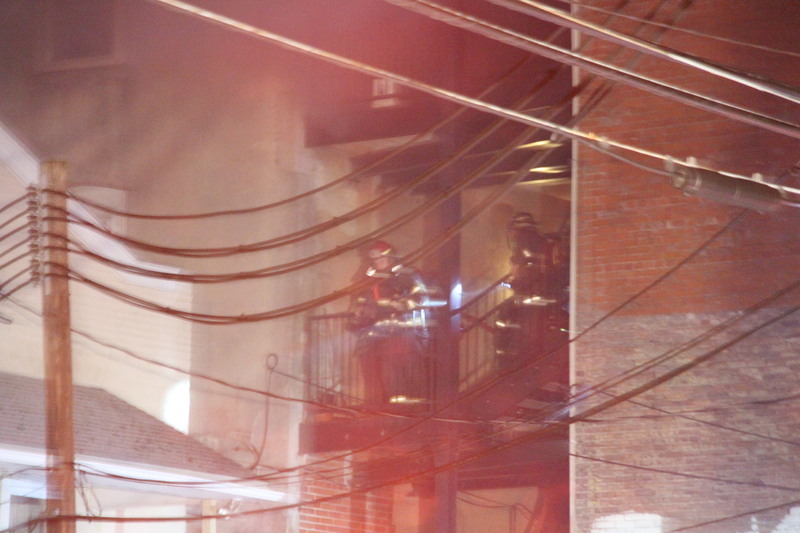 A resident from the second floor said that noises were heard upstairs earlier in the day by another tenant. 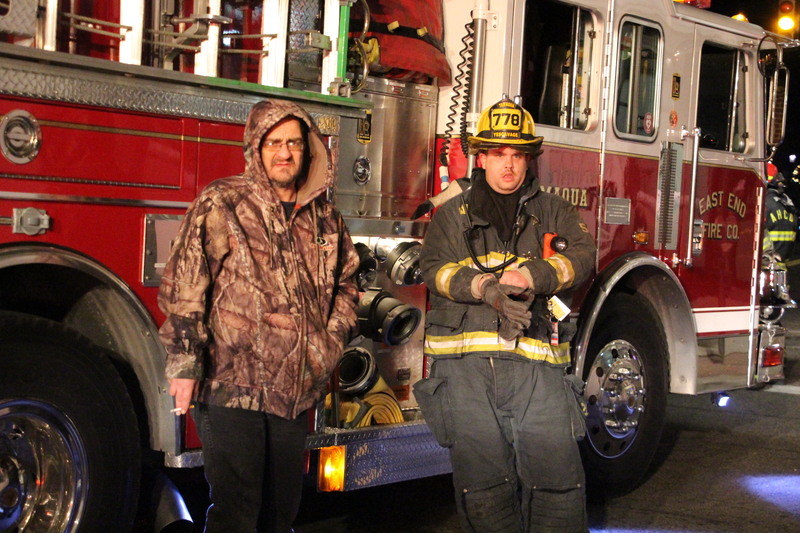 He added that his two dogs woke him up during the fire. 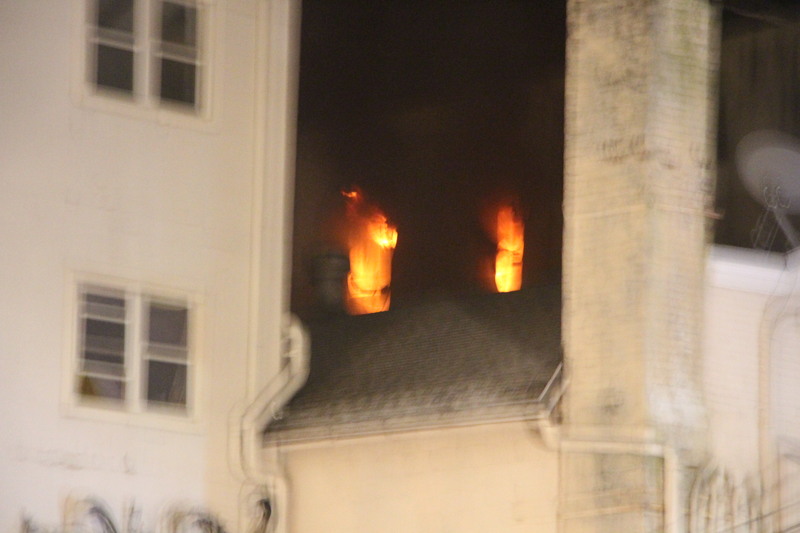 Comments from people on Facebook said they could smell smoke 2 miles away. 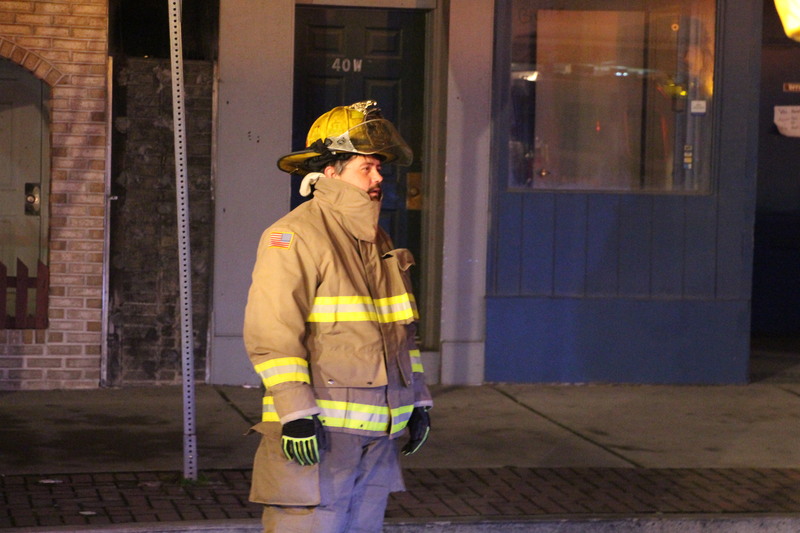 One resident commented on Facebook that he smelled the smoke in Hometown. Neighbors said that the building is well-taken care of and was recently remodeled inside a year or so ago. 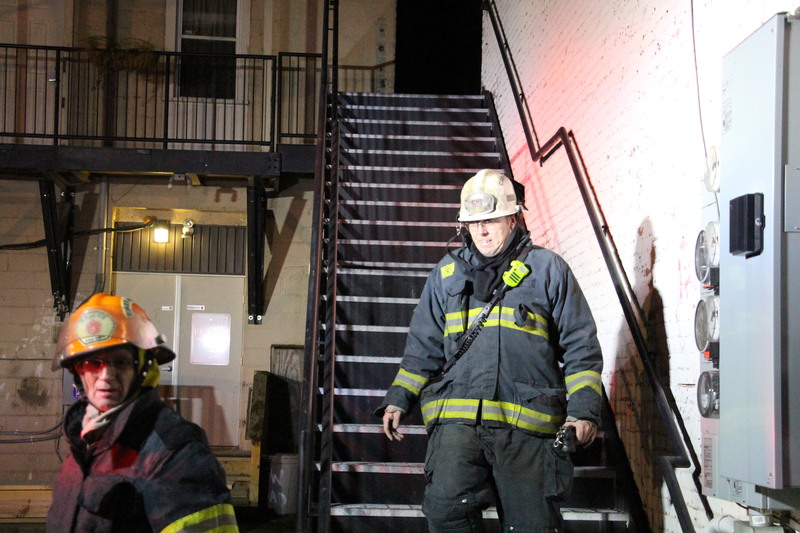 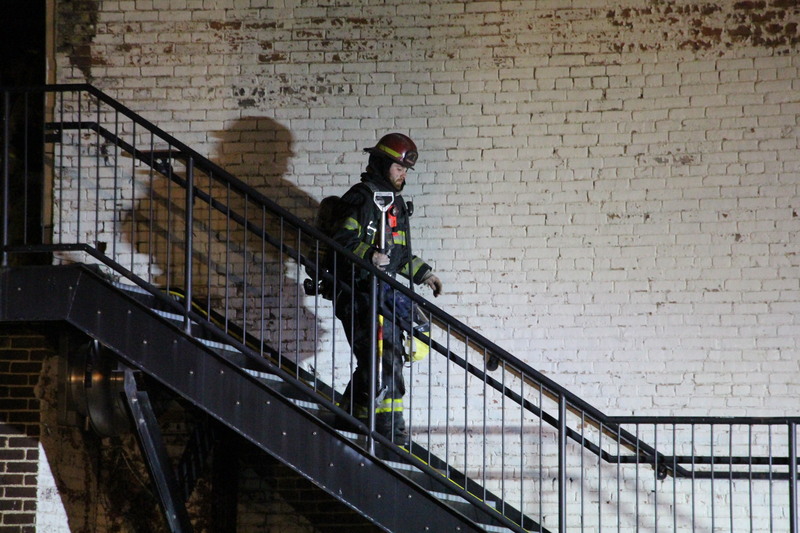 Firefighters said that the fire resulted in a busted water pipe break on the third or fourth floor. 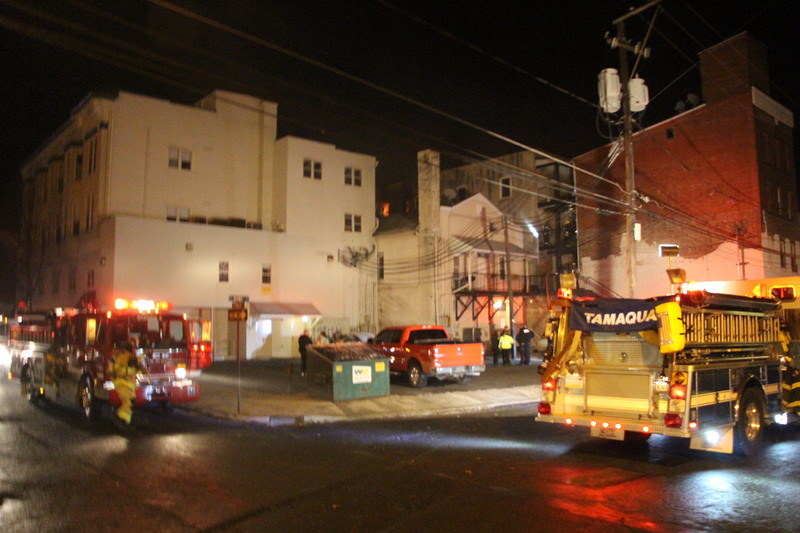 On scene were Tamaqua Rescue Squad, Citizen’s Fire Company, South Ward Fire Company, American Hose Company, East End Fire Company, Tamaqua Ambulance, and Tamaqua Police. 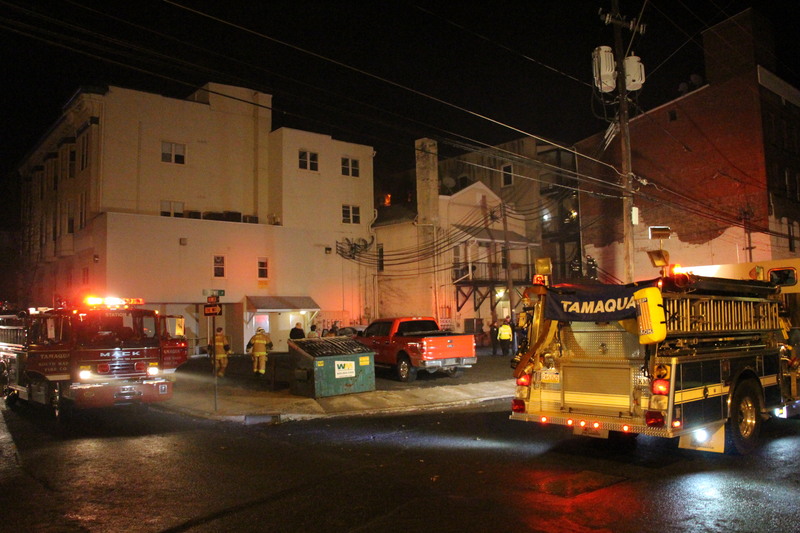 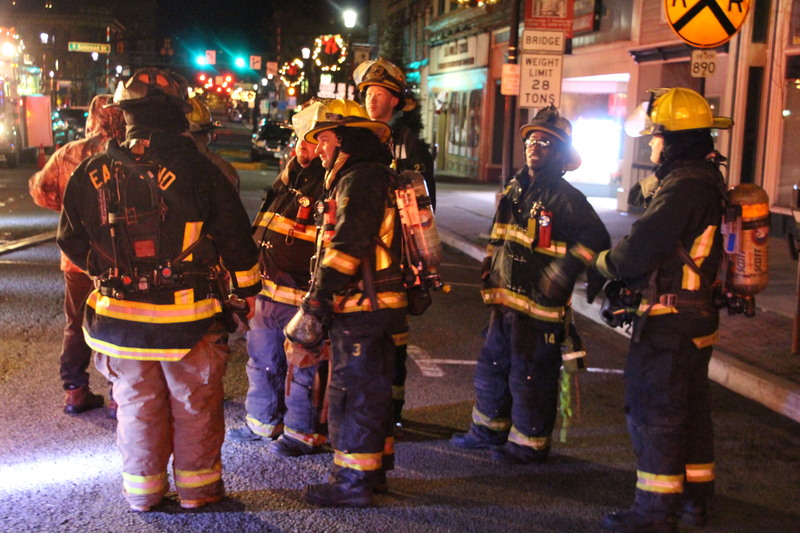 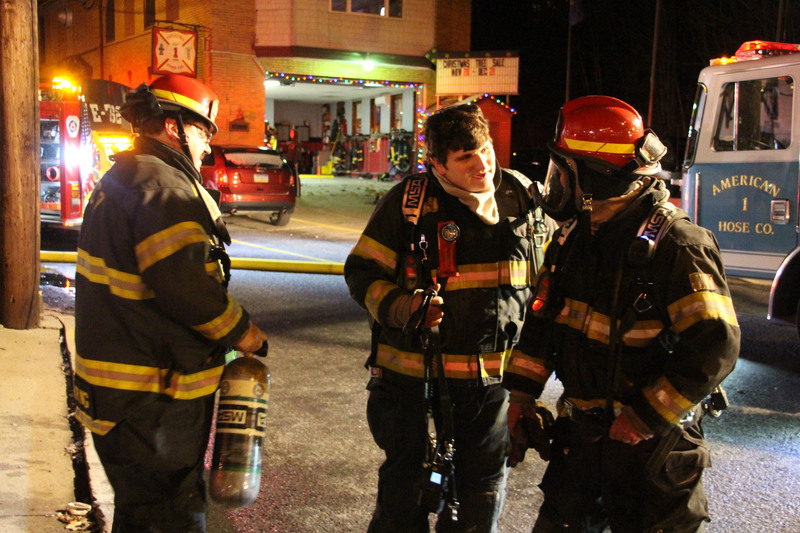 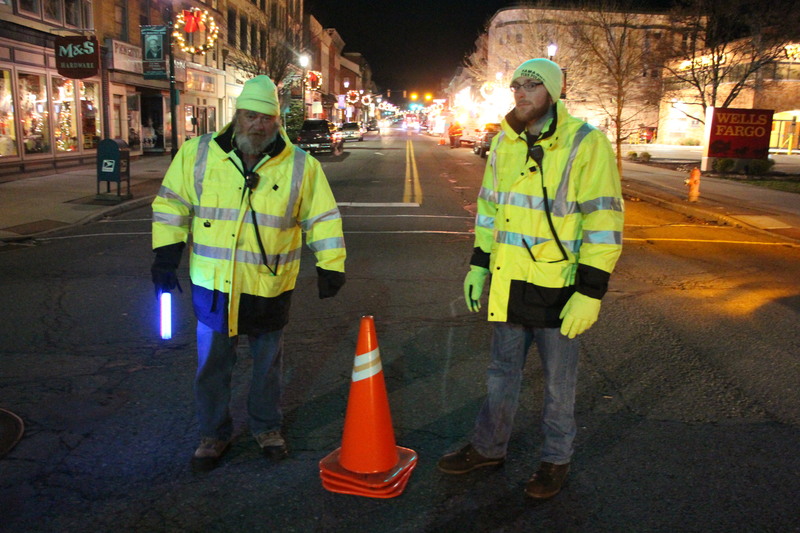 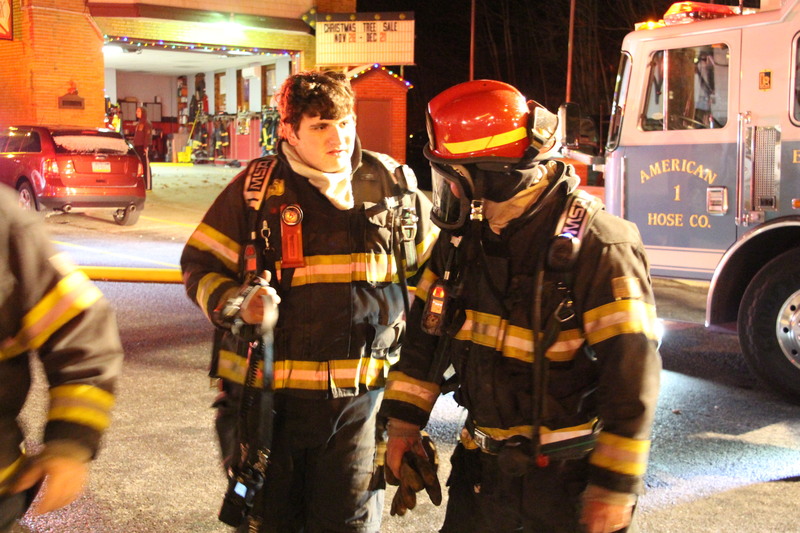 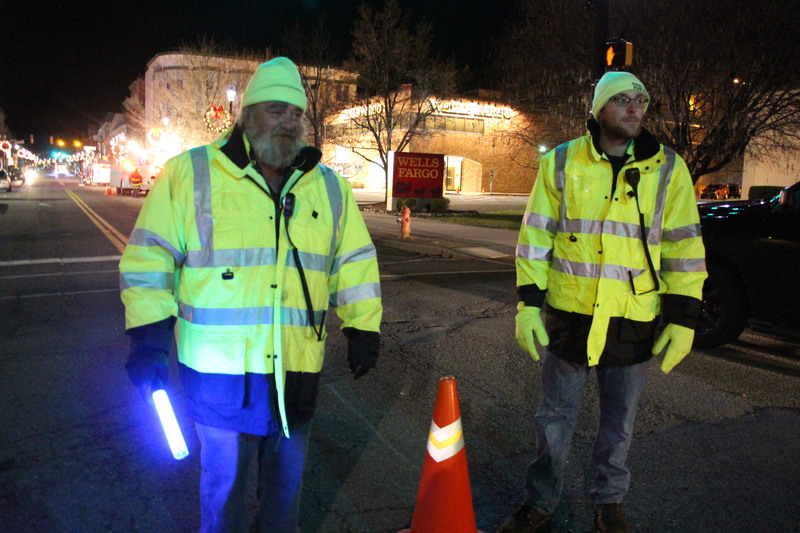 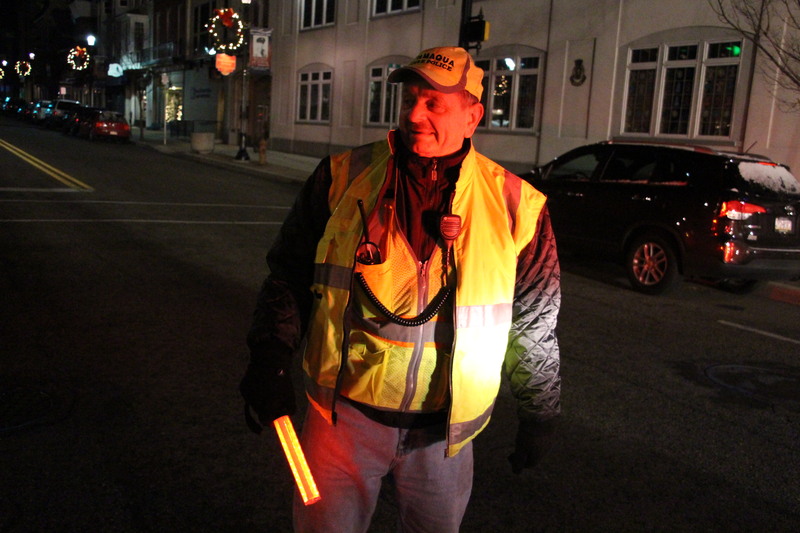 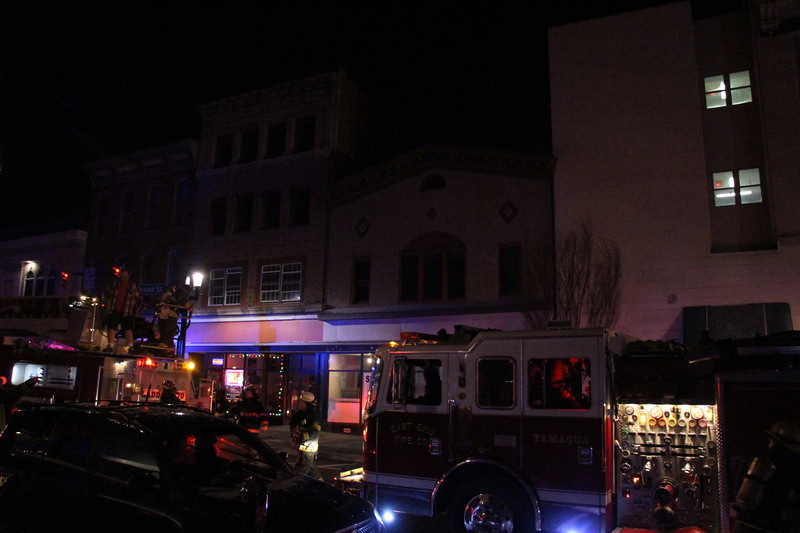 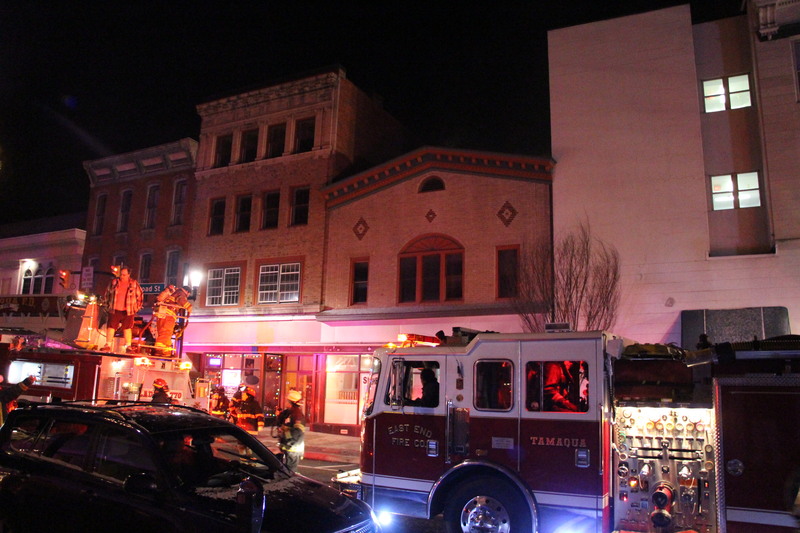 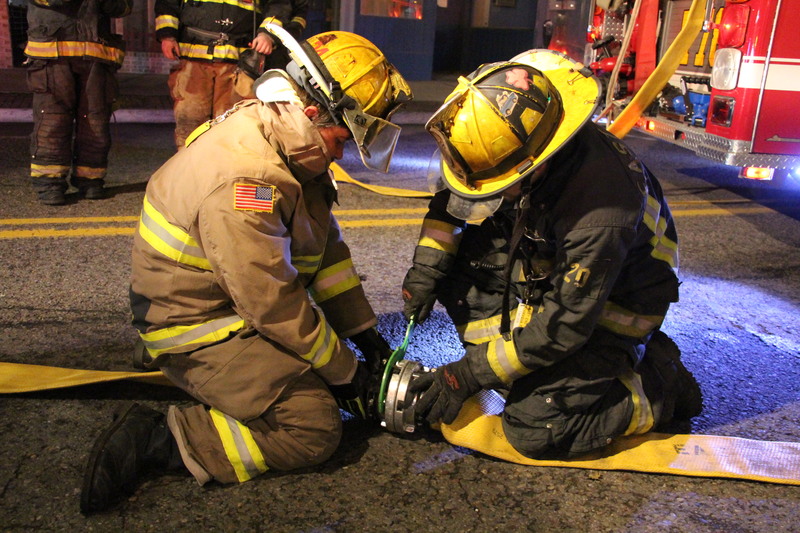 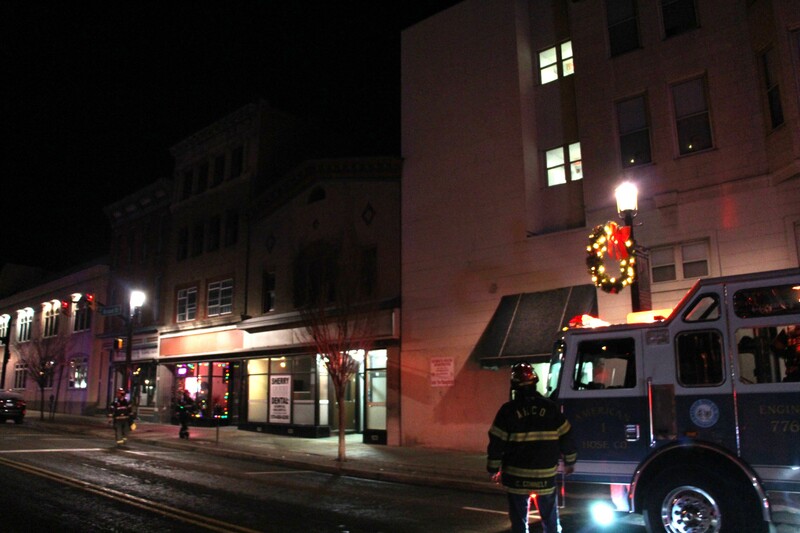 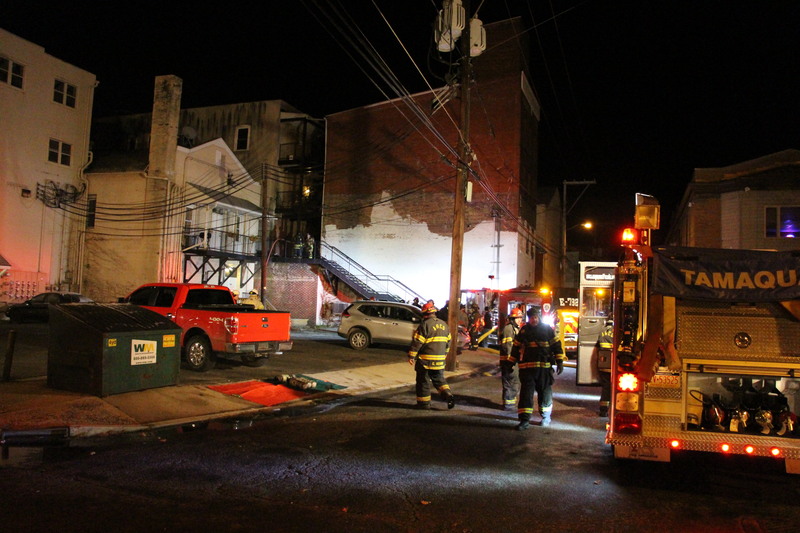 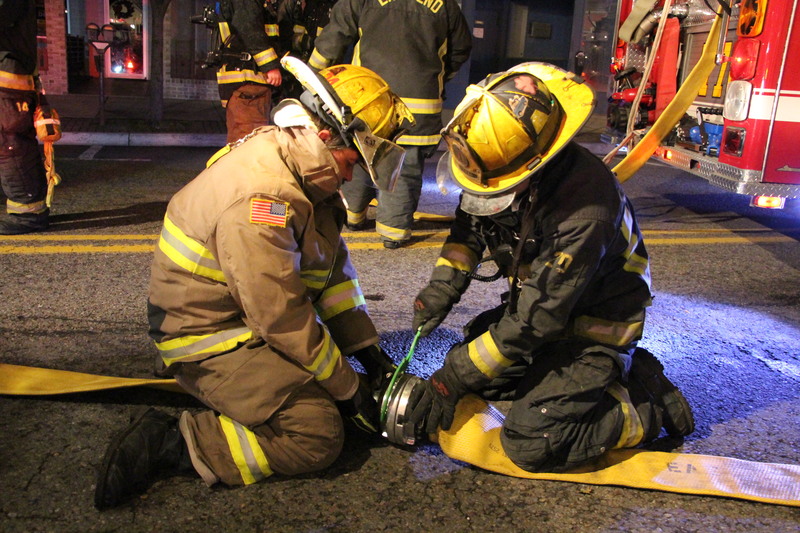 Tamaqua Fire Police closed the 100 and 200 block of West Broad Street (US209) for the duration of the response. 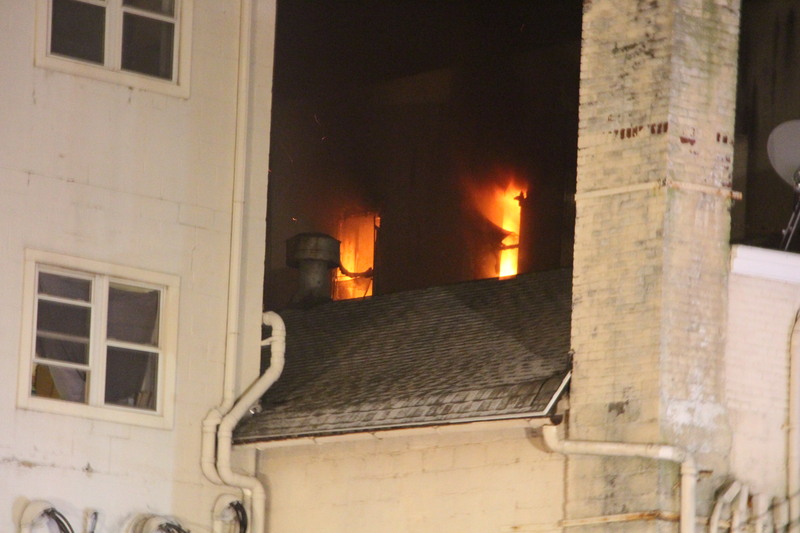 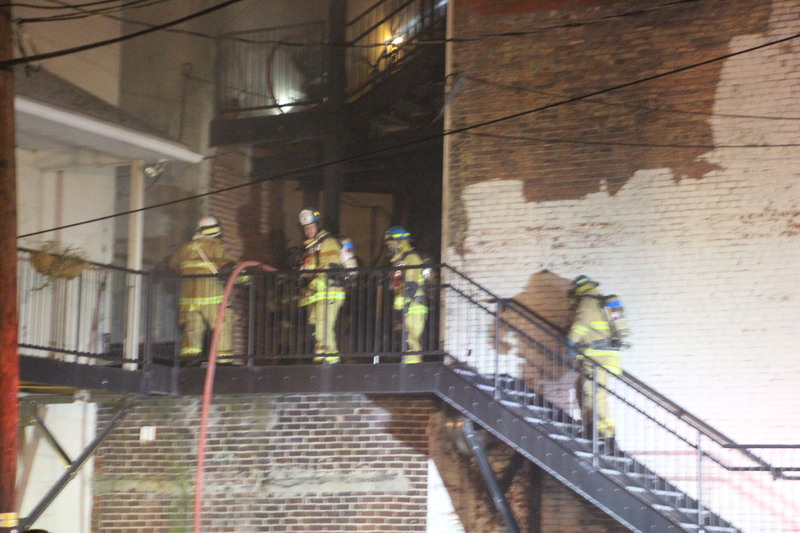 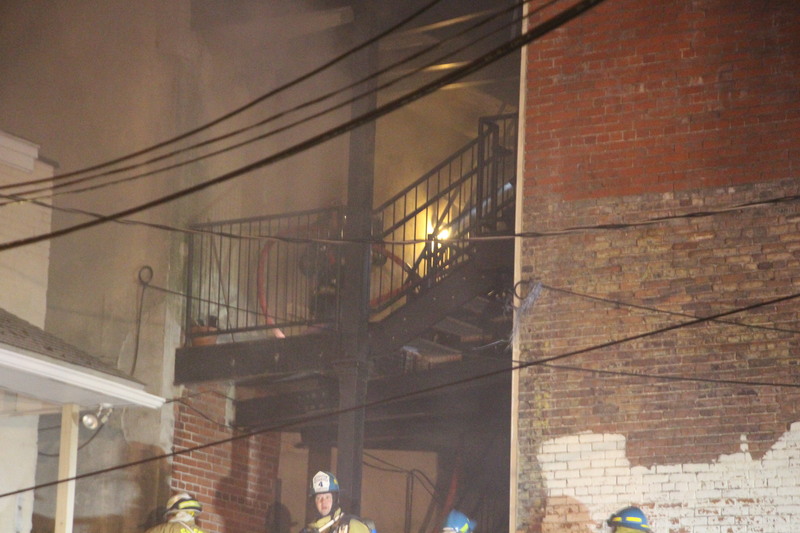 It is unknown if any of the tenants on the second floor are displaced long-term. 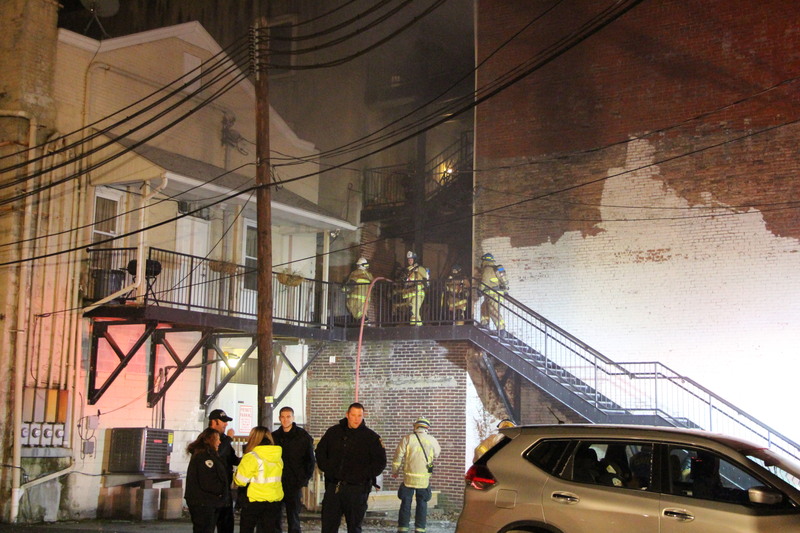 It is also unknown if the fire spread to or damaged adjacent properties at 47 West Broad Street (Daniel Bingaman Insurance) or 41 West Broad Street (occupied by Sherry Dental PC). 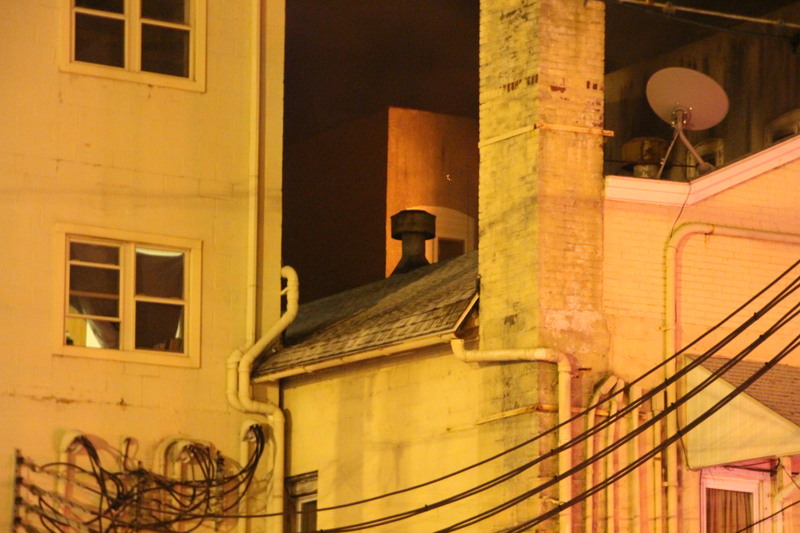 No more information is available. 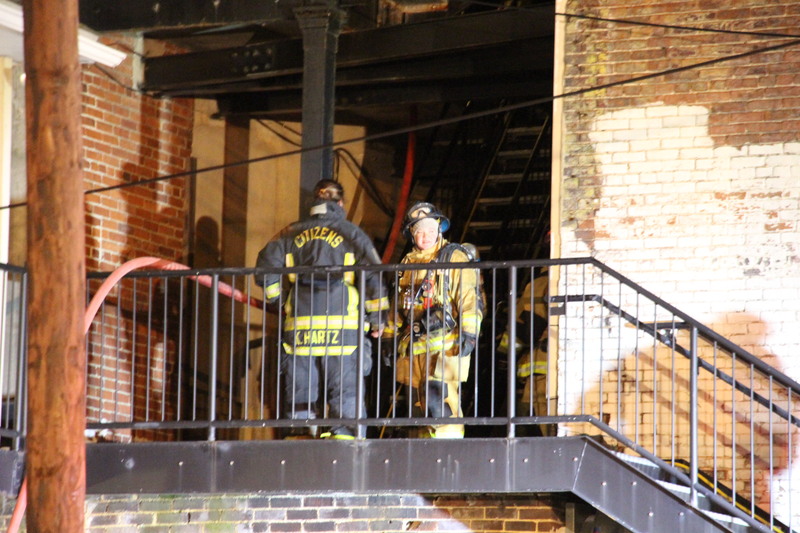 Officials on scene said the fire is under investigation.